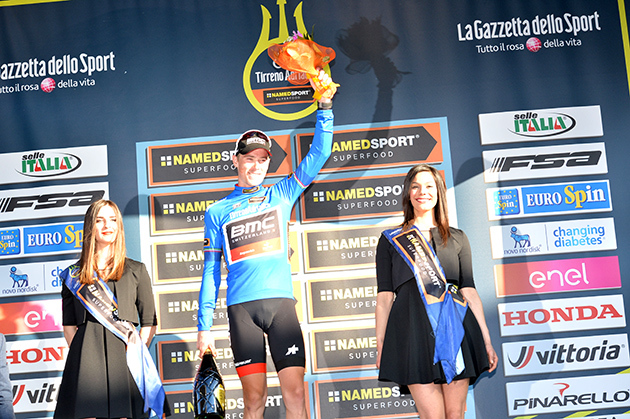 The race: Here's the story from stage winner Rohan Dennis' BMC team. 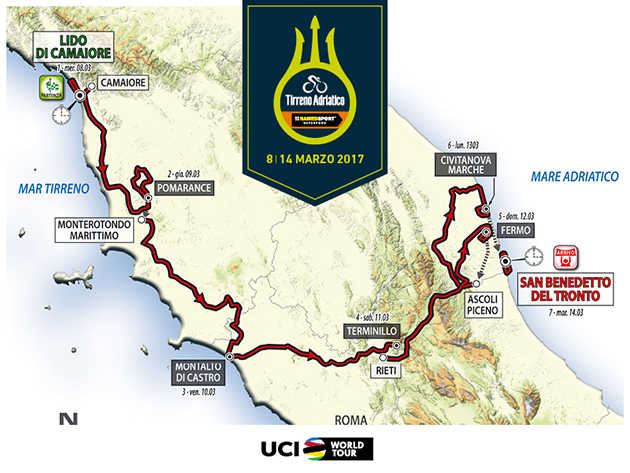 14 March 2017, San Benedetto del Tronto (ITA): After over 1,000km of racing the final podium at Tirreno-Adriatico came down to a 10km time trial along the San Benedetto del Tronto seafront with Rohan Dennis proving that he was the fastest man against the clock, taking the stage win and securing second overall on the General Classification. As Dennis headed out onto the course, he was chasing the early benchmark set by Jos Van Emden (Team LottoNL-Jumbo) of 11'21". 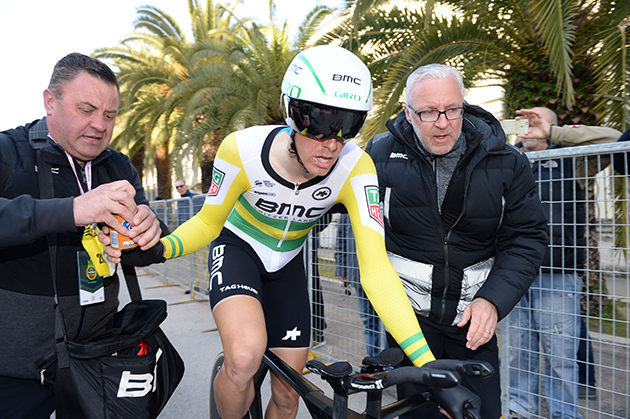 But with the course being completely flat it was the perfect time trial for the current Australian national time trial champion to show why he is known as one of the best time trialists in the world, clocking a time of 11'18" on the line. With only two riders still to come home, it was a short but nervous wait in the hot seat to find out the outcome of the General Classification. In the end, Dennis' time was enough to see him move into second overall, 25 seconds behind Nairo Quintana (Movistar Team). Congratulations, Rohan! You started this week with a win in the team time trial and finished it off with the win today. Can you describe how this week has been for you? "It has been a very good week for both myself and the team. To start off with a win and then hold onto the leader's jersey for three days was great. I am really happy that I was able to take the win today and move into second overall on the GC. The work the team did for me over the whole week was incredible. Today's victory really shows that all of the guys' faith in me was worth it." How was it out on the course today? "It wasn't easy. I went out to half way trying to stick to one plan and then try and lift the pace for the second half. I tried to break it up into little parts, thinking about when I could get a rest and when I couldn't. But it was a tough course out there, especially with the headwind home." 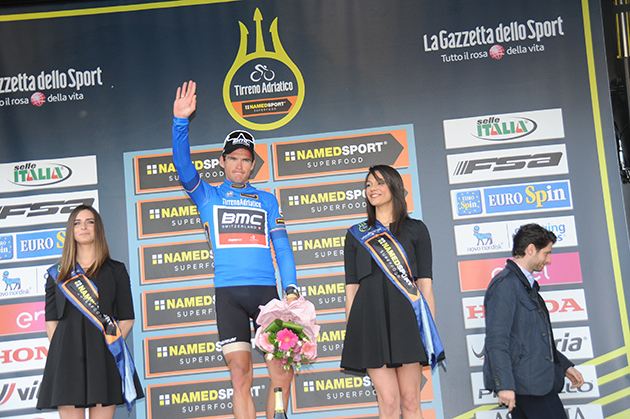 Greg Van Avermaet: "I am happy with my Tirreno-Adriatico. There were a few chances for me, but I leave this race feeling good, and I am happy with my form. I didn't come into this race looking to defend my title, it was about continuing my preparations for the Classics, and I think it has been a success in that respect. I am looking forward to the races coming up." Manuel Quinziato: "I did what I could today, and honestly I am happy with my shape this week as I had a late start to the season. I think I did a good job on the way out today and then on the last few kilometers, I dropped the speed a little. But I can be happy, and I feel like I honored my national champion's jersey. It has been a really great week for the whole team so, I think we can leave Tirreno-Adriatico satisfied that we all gave 100%." Sports Director, Max Sciandri: "I think we took the maximum we could out of this race. 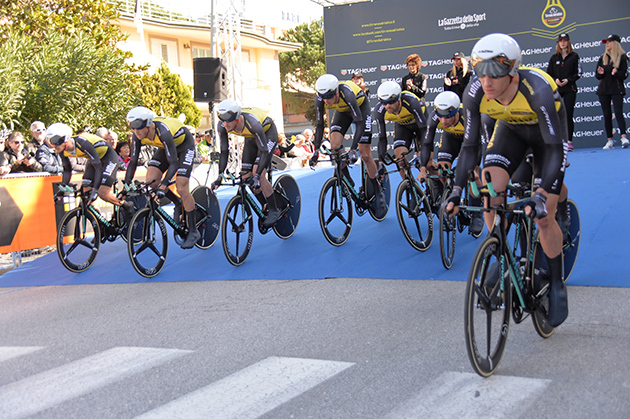 Winning the opening team time trial was an important goal for us and then being able to back it up with the final stage win capped off a great week. Regarding the General Classification, I think we can be really happy with how Rohan Dennis performed. He rode exceptionally well and this week has been a great learning experience for him." 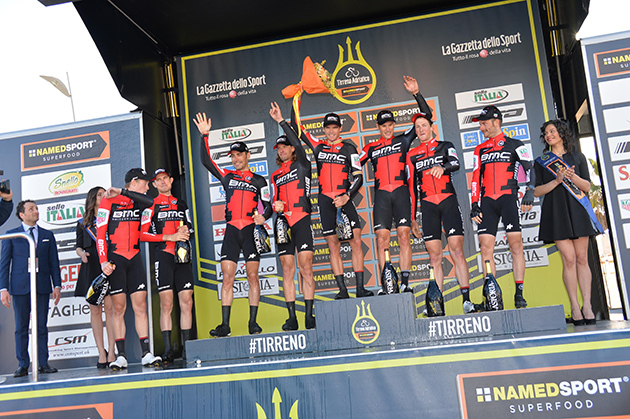 "For Tejay van Garderen this was only his second race of the season, and it was his first big test. It was good to see him finding his racing mindset once again, and I thought he looked good when he attacked at the end of stage 5. The rest of the team did a great job all week. The guys rode well as a team, and it was great to see how strong guys like Manuel Quinziato, Daniel Oss, and Jempy Drucker were riding out at the front of the peloton for much of the race." 3 Michael HEPBURN Orica-Scott s.t. 10 Alex DOWSETT Movistar s.t. 12 Tobias LUDVIGSSON FDJ s.t. 17 Thibaut PINOT FDJ s.t. 18 Jonathan CASTROVIEJO Movistar s.t. 21 Mattia CATTANEO Androni Giocattoli s.t. 22 Vasil KIRYIENKA Sky s.t. 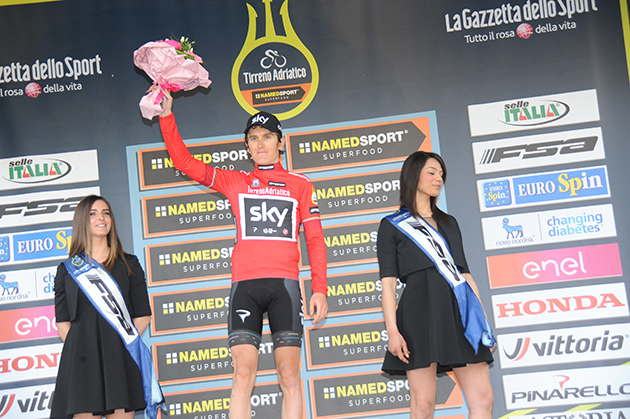 24 Gianni MOSCON Sky s.t. 26 Matthieu LADAGNOUS FDJ s.t. 28 Filippo GANNA UAE Abu Dhabi s.t. 30 ANDREY GRIVKO Astana s.t. 31 Paul MARTENS Lotto NL-Jumbo s.t. 32 Daryl IMPEY Orica-Scott s.t. 33 Anthony ROUX FDJ s.t. 34 Robert GESINK Lotto NL-Jumbo s.t. 37 Jérémy ROY FDJ s.t. 38 Fabio FELLINE Trek-Segafredo s.t. 39 Domenico POZZOVIVO Ag2r La Mondiale s.t. 40 Chad HAGA Sunweb s.t. 42 Bob JUNGELS Quick-Step s.t. 47 Bauke MOLLEMA Trek-Segafredo s.t. 48 Dmitriy GRUZDEV Astana s.t. 50 Reto HOLLENSTEIN Katusha Alpecin s.t. 52 Daniel OSS BMC s.t. 53 Matej MOHORIC UAE Abu Dhabi s.t. 54 Simon ŠPILAK Katusha Alpecin s.t. 55 Rigoberto URAN Cannondale Drapac s.t. 57 Zdenek ŠTYBAR Quick-Step s.t. 59 Manuele BOARO Bahrain-Merida s.t. 60 Maxime MONFORT Lotto Soudal s.t. 61 Juan Jose LOBATO Lotto NL-Jumbo s.t. 62 Vegard Stake LAENGEN UAE Abu Dhabi s.t. 65 Tiesj BENOOT Lotto Soudal s.t. 68 Julien VERMOTE Quick-Step s.t. 70 Iuri FILOSI Nippo-Vini Fantini s.t. 73 Søren Kragh ANDERSEN Sunweb s.t. 77 Salvatore PUCCIO Sky s.t. 79 Jan BAKELANTS Ag2r La Mondiale s.t. 80 Matteo TRENTIN Quick-Step s.t. 82 Luis León SANCHEZ Astana s.t. 83 Nelson OLIVEIRA Movistar s.t. 85 Marco MARCATO UAE Abu Dhabi s.t. 87 Marco COLEDAN Trek-Segafredo s.t. 88 Jens DEBUSSCHERE Lotto Soudal s.t. 89 Bart DE CLERCQ Lotto Soudal s.t. 91 Luka MEZGEC Orica-Scott s.t. 92 Jasper STUYVEN Trek-Segafredo s.t. 94 Rafal MAJKA Bora-hansgrohe s.t. 95 Davide BALLERINI Androni Giocattoli s.t. 97 Enrico BATTAGLIN Lotto NL-Jumbo s.t. 98 Javier MORENO Bahrain-Merida s.t. 104 Michele SCARPONI Astana s.t. 106 Moreno MOSER Astana s.t. 108 Pawel POLJANSKI Bora-hansgrohe s.t. 109 Maurits LAMMERTINK Katusha Alpecin s.t. 110 Eduard Michael GROSU Nippo-Vini Fantini s.t. 112 Sacha MODOLO UAE Abu Dhabi s.t. 114 Franco PELLIZOTTI Bahrain-Merida s.t. 117 Francesco GAVAZZI Androni Giocattoli s.t. 119 Jay Robert THOMSON Dimension Data s.t. 123 Javier MEGIAS LEAL Novo Nordisk s.t. 125 Mirco MAESTRI Bardiani-CSF s.t. 128 Matvey MAMYKIN Katusha Alpecin s.t. 129 Mark RENSHAW Dimension Data s.t. 133 Boy VAN POPPEL Trek-Segafredo s.t. 139 Diego ROSA Sky s.t. 141 Andrea PALINI Androni Giocattoli s.t. 142 Simon CLARKE Cannondale Drapac s.t. 142 Tom BOONEN Quick-Step s.t. 147 Simone ANDREETTA Bardiani-CSF s.t. 151 Joonas HENTTALA Novo Nordisk s.t. 65 Javier MORENO Bahrain-Merida s.t. 85 Julien VERMOTE Quick-Step s.t. Weather at the finish town of Civitanova Marche at 1:09 local time: 13C (55F), sunny with the wind from the NNE at 11 km/hr (7 mph). 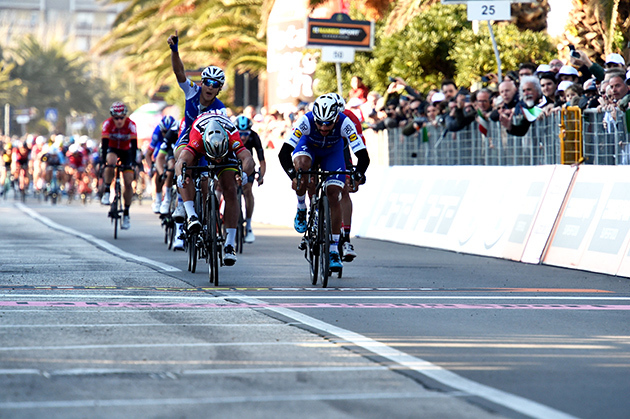 The race: Here's the stage story from stage winner Fernando Gaviria's Quick Step team. 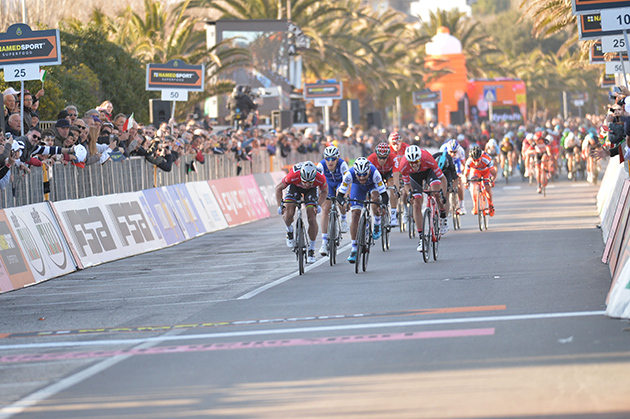 Fernando Gaviria returned to winning ways, four weeks after nabbing a stage at Volta ao Algarve. 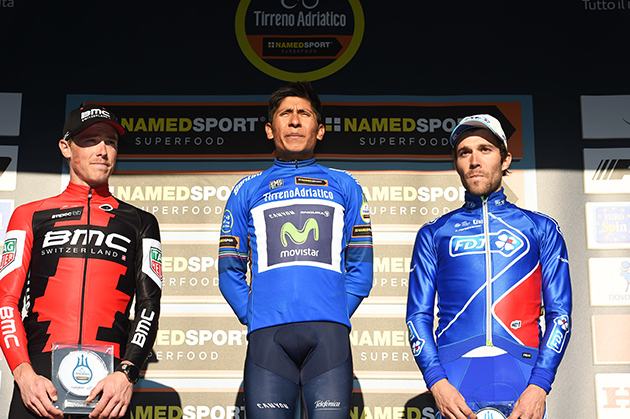 This time, the 22-year-old South American came out on top at Tirreno-Adriatico, same race which last year witnessed his first World Tour success, on a day made exciting by the countless attacks launched by several riders on a small lump with stiff gradients coming nine kilometers from the finish. 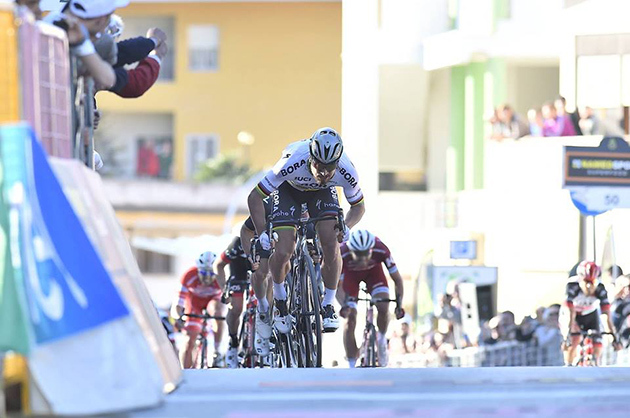 Until that point, Julien Vermote put in a mountain of work at the head of the bunch, setting a strong pace behind the eight escapees and controlling their advantage, before clawing them back – with the help of Dimension Data and Team Sky – in the final part of the stage to Civitanova Marche. On the unclassified climb, some riders threw caution to the wind, but Luxembourg Champion Bob Jungels covered these attacks, before Niki Terpstra joined a four-man move which opened a 10-second gap over the top of the hill. 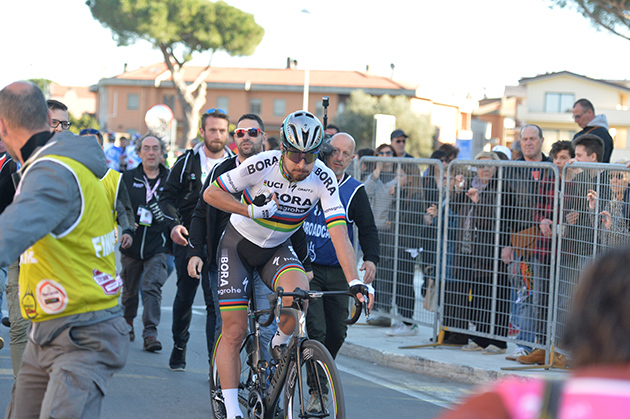 Behind, Peter Sagan (Bora-Hansgrohe) accelerated, trying to split the field, but Fernando Gaviria responded immediately and jumped on the world champion's wheel. On the flat section towards the line, the bunch reabsorbed the group of Niki Terpstra and the sprinters began moving to the front, despite the messy finish which splintered the peloton before the flamme rouge. 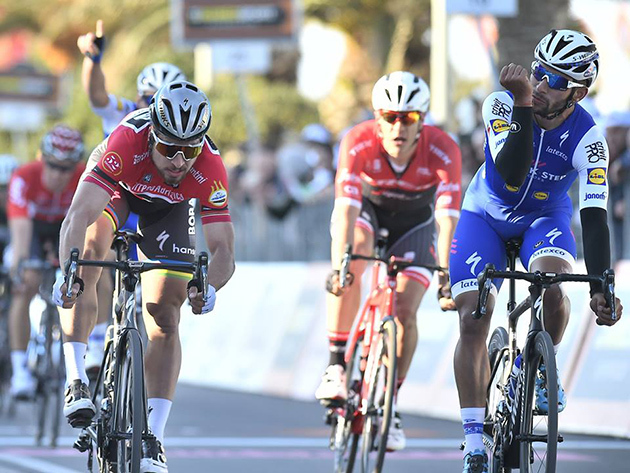 Gaviria made the most out of his incredible turn of speed, going in a head-to-head contest with Sagan and defeating him for his fourth victory of the year. "I'm happy to take this victory, it's a well-deserved success for our squad after a week during which we worked and fought hard. 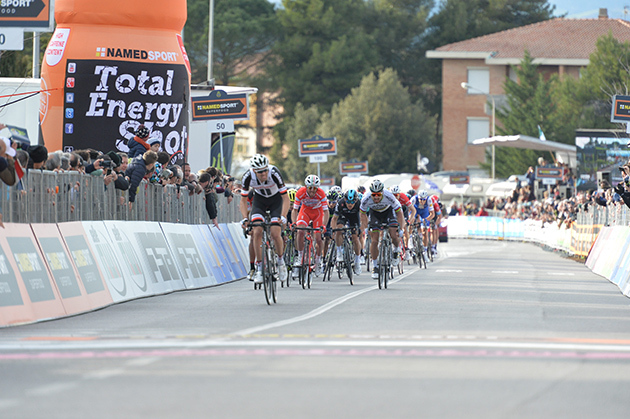 I knew it was the last opportunity for the sprinters and to get another win at Tirreno-Adriatico makes me very happy. 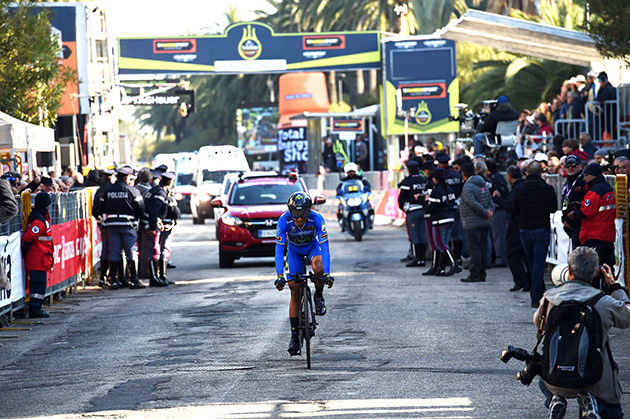 This victory gives me confidence for the upcoming races", said Fernando Gaviria, one of the two Colombian riders to nab a win in the "Race of the Two Seas" since its inception, in 1966. 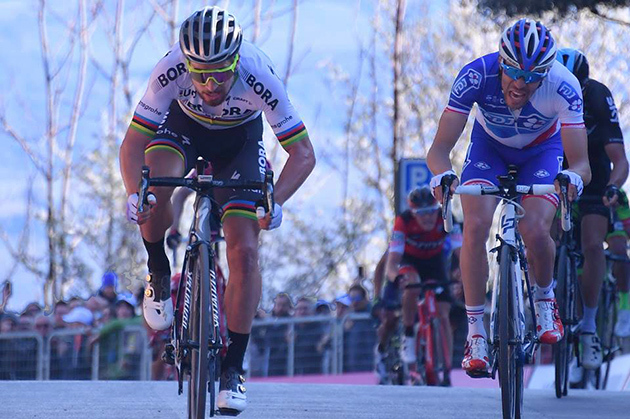 The data provided by his Velon tracker – a maximum power peak of 1277W during the 260m-long sprint which saw him hit a 69.8km/h top speed on the seafront of Civitanova Marche – come as testimony of how strong the Quick-Step Floors rider was on that crucial part of the stage. "When Sagan attacked, I followed him and thanks to the fact Niki was in the front I could stay relaxed on his wheel. In the final 200 meters, I kept my eyes on him and when I noticed he wanted to open his sprint, I decided to move first. I had good legs and enough power to keep a small gap, even if he was coming back really strongly. He is one of the best riders in the peloton and to beat him it's an honor", concluded Fernando, who brought Quick-Step Floors' 16th victory of the year. 4 Matteo TRENTIN Quick-Step s.t. 5 Jens DEBUSSCHERE Lotto Soudal s.t. 6 Elia VIVIANI Sky s.t. 7 Scott THWAITES Dimension Data s.t. 8 Eduard Michael GROSU Nippo-Vini Fantini s.t. 9 Anthony ROUX FDJ s.t. 10 Jurgen ROELANDTS Lotto Soudal s.t. 12 Egan Arley BERNAL Androni Giocattoli s.t. 13 Reto HOLLENSTEIN Katusha Alpecin s.t. 14 Jan BAKELANTS Ag2r La Mondiale s.t. 15 Roberto FERRARI UAE Abu Dhabi s.t. 16 Nairo QUINTANA Movistar s.t. 17 Rick ZABEL Katusha Alpecin s.t. 18 Sacha MODOLO UAE Abu Dhabi s.t. 19 Primož ROGLIC Lotto NL-Jumbo s.t. 20 Rohan DENIS BMC s.t. 21 Thibaut PINOT FDJ s.t. 22 Jonathan CASTROVIEJO Movistar s.t. 23 Edvald BOASSON HAGEN Dimension Data s.t. 24 Andrea PALINI Androni Giocattoli s.t. 26 Rigoberto URAN Cannondale Drapac s.t. 27 Rui Alberto FARIA UAE Abu Dhabi s.t. 28 Luka MEZGEC Orica-Scott s.t. 29 Georg PREIDLER Sunweb s.t. 30 Domenico POZZOVIVO Ag2r La Mondiale s.t. 31 Juan Jose LOBATO Lotto NL-Jumbo s.t. 32 Jean-Pierre DRUCKER BMC s.t. 33 Søren Kragh ANDERSEN Sunweb s.t. 34 Tom DUMOULIN Sunweb s.t. 35 Boy VAN POPPEL Trek-Segafredo s.t. 36 Simon ŠPILAK Katusha Alpecin s.t. 37 Bauke MOLLEMA Trek-Segafredo s.t. 38 Bob JUNGELS Quick-Step s.t. 39 Robert GESINK Lotto NL-Jumbo s.t. 40 Maurits LAMMERTINK Katusha Alpecin s.t. 41 Salvatore PUCCIO Sky s.t. 42 Luis León SANCHEZ Astana s.t. 43 Daniele BENNATI Movistar s.t. 44 Andrey AMADOR Movistar s.t. 45 Vincenzo NIBALI Bahrain-Merida s.t. 46 Damiano CARUSO BMC s.t. 47 Pawel POLJANSKI Bora-hansgrohe s.t. 48 Rafal MAJKA Bora-hansgrohe s.t. 50 Oscar GATTO Astana s.t. 51 Michele SCARPONI Astana s.t. 52 Daniel MORENO Movistar s.t. 53 Sébastien REICHENBACH FDJ s.t. 54 Mike TEUNISSEN Sunweb s.t. 55 Hugo HOULE Ag2r La Mondiale s.t. 56 Fabio FELLINE Trek-Segafredo s.t. 57 Franco PELLIZOTTI Bahrain-Merida s.t. 58 Gediminas BAGDONAS Ag2r La Mondiale s.t. 59 Giovanni VISCONTI Bahrain-Merida s.t. 60 Sebastian LANGEVELD Cannondale Drapac s.t. 61 Marcus BURGHARDT Bora-hansgrohe s.t. 63 Alberto BETTIOL Cannondale Drapac s.t. 64 Pavel KOCHETKOV Katusha Alpecin s.t. 65 Simone VELASCO Bardiani-CSF s.t. 66 Iljo KEISSE Quick-Step s.t. 67 Maxime MONFORT Lotto Soudal s.t. 68 Tobias LUDVIGSSON FDJ s.t. 69 Matthieu LADAGNOUS FDJ s.t. 70 Mattia CATTANEO Androni Giocattoli s.t. 71 Ramon SINKELDAM Sunweb s.t. 72 Enrico BATTAGLIN Lotto NL-Jumbo s.t. 74 Marco CANOLA Nippo-Vini Fantini s.t. 75 Andrey ZEITS Astana s.t. 76 Rein TAARAMÄE Katusha Alpecin s.t. 77 Francesco GAVAZZI Androni Giocattoli s.t. 78 Jérémy ROY FDJ s.t. 79 Ángel VICIOSO Katusha Alpecin s.t. 80 Zdenek ŠTYBAR Quick-Step s.t. 82 Tiesj BENOOT Lotto Soudal s.t. 83 Niki TERPSTRA Quick-Step s.t. 84 Marco MARCATO UAE Abu Dhabi s.t. 85 Daryl IMPEY Orica-Scott s.t. 88 Ivan SANTAROMITA Nippo-Vini Fantini s.t. 89 Steve MORABITO FDJ s.t. 90 David LOZANO RIBA Novo Nordisk s.t. 91 Hideto NAKANE Nippo-Vini Fantini s.t. 92 Iuri FILOSI Nippo-Vini Fantini s.t. 93 Kanstantsin SIUTSOU Bahrain-Merida s.t. 97 Alexandre GENIEZ Ag2r La Mondiale s.t. 99 Tim WELLENS Lotto Soudal s.t. 104 Davide BALLERINI Androni Giocattoli s.t. 105 Jasha SÜTTERLIN Movistar s.t. 107 Ben GASTAUER Ag2r La Mondiale s.t. 108 Nicola RUFFONI Bardiani-CSF s.t. 109 Stefan KÜNG BMC s.t. 111 Paul MARTENS Lotto NL-Jumbo s.t. 112 Marco FRAPPORTI Androni Giocattoli s.t. 113 Matvey MAMYKIN Katusha Alpecin s.t. 114 Nelson OLIVEIRA Movistar s.t. 116 Bart DE CLERCQ Lotto Soudal s.t. 117 Andrea PERON Novo Nordisk s.t. 118 Maciej BODNAR Bora-hansgrohe s.t. 119 Alan MARANGONI Nippo-Vini Fantini s.t. 121 Max WALSCHEID Sunweb s.t. 124 Moreno MOSER Astana s.t. 125 ANDREY GRIVKO Astana s.t. 126 Tom BOONEN Quick-Step s.t. 127 Julien VERMOTE Quick-Step s.t. 128 Manuel QUINZIATO BMC s.t. 129 Martijn VERSCHOOR Novo Nordisk s.t. 130 Lars BOOM Lotto NL-Jumbo s.t. 131 Albert TIMMER Sunweb s.t. 132 Javier MEGIAS LEAL Novo Nordisk s.t. 133 Ryan MULLEN Cannondale Drapac s.t. 134 Stephen CUMMINGS Dimension Data s.t. 135 Bernhard EISEL Dimension Data s.t. 136 Simon CLARKE Cannondale Drapac s.t. 137 Johann VAN ZYL Dimension Data s.t. 138 Dmitriy GRUZDEV Astana s.t. 140 Dylan VAN BAARLE Cannondale Drapac s.t. 141 Marko KUMP UAE Abu Dhabi s.t. 142 Vegard Stake LAENGEN UAE Abu Dhabi s.t. 143 Kohei UCHIMA Nippo-Vini Fantini s.t. 144 Jos VAN EMDEN Lotto NL-Jumbo s.t. 145 Aleksejs SARAMOTINS Bora-hansgrohe s.t. 146 Nicola BOEM Bardiani-CSF s.t. 147 Mirco MAESTRI Bardiani-CSF s.t. 148 Luca WACKERMANN Bardiani-CSF s.t. 149 Raffaello BONUSI Androni Giocattoli s.t. 150 Filippo GANNA UAE Abu Dhabi s.t. 153 Marco COLEDAN Trek-Segafredo s.t. 154 Jay Robert THOMSON Dimension Data s.t. 155 Joonas HENTTALA Novo Nordisk s.t. 156 Simone ANDREETTA Bardiani-CSF s.t. 157 Markel IRIZAR Trek-Segafredo s.t. 158 Matthias BRÄNDLE Trek-Segafredo s.t. 159 Sep VANMARCKE Cannondale Drapac s.t. Peter Sagan signs in. Note his arm warmers have rainbow stripes. 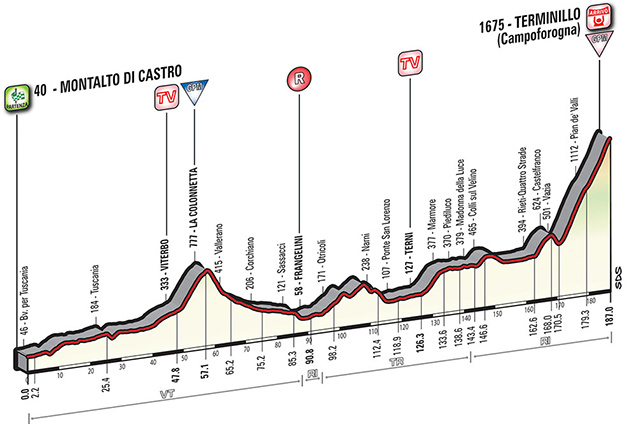 Weather at the finish city of Fermo @ 1:49 PM, local time: 12C (54F), sunny with the wind from the east at 16 km/hr (10 mph). The race: Here's the story from stage winner Peter Sagan's Bora-hansgrohe team. A tough stage with an even tougher finish was on the cards for the riders today. After a relentlessly undulating profile that got harder as the stage went on, two tough ramps in the finale meant only the strongest would be able to contest the finish. Surrounded by all-rounders and GC riders alike, the UCI World Champion was the picture of controlled calm, as he picked off his rivals in a final push to the line to take the win in style, ably supported in the final kilometres by his BORA-hansgrohe teammates, and to regain the red points jersey. 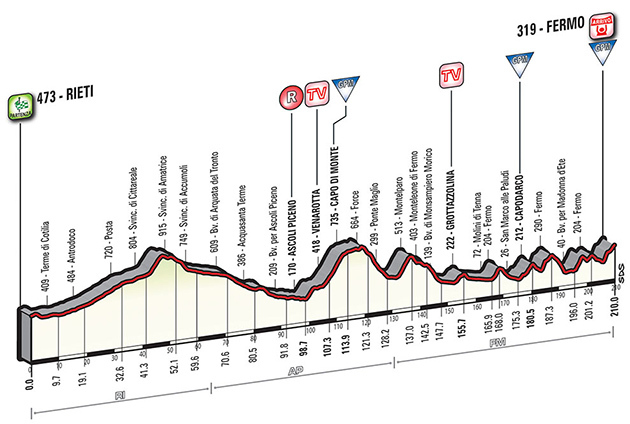 209km and a rolling profile would separate riders from the start in Rieti and a chance for victory in Fermo. The first 100km were gentle enough – a steady climb before an equally steady descent, but from here the whole character of the day would change, with one gradual climb replaced with a sawtooth profile for the rest of the stage. If the parcours wasn’t hard enough, the final kilometre brought with it a 22% ramp before a 10% scramble to the finish. This was a finale that didn’t suit any one type of rider and anyone could take the win. As expected, a break went off early on – trying to make the most of the more gradual start to the day before the really hard climbs began appearing on the horizon. A group of eleven bumped their advantage up to four minutes, but not long after were reeled back in to a more manageable two minutes. This was a stage where strategy and a lucky break could win, so none of the teams was taking any chances. With 90km remaining, it was all back together, only for another break to go at the 80km mark – this time a much bigger group of thirty, with another smaller group attacking off the front of this one. The final 35km were cruel – with multiple steep ramps followed by equally steep descents – sapping the energy from the riders’ legs and bringing the escape back within touching distance. The whole peloton was doubtless thinking about the final 22% ramp that would prove decisive, and were saving their legs. In the peloton, UCI World Champion, Peter Sagan, was doing exactly that. On the big climbs, the Slovak rider was rooted to his saddle while others around him were grinding their way up. Also visible in the bunch was Rafał Majka, pushing hard at the front to support Peter, but there was no hiding from the fact it was getting harder, as the peloton started shedding riders as the GC contenders started pushing as well as the all-rounders. Picking off riders one by one, Peter took to the front on the 22% ramp as the cobblestone streets narrowed, finally kicking and leaving everyone behind to take the win in the most amazing style. 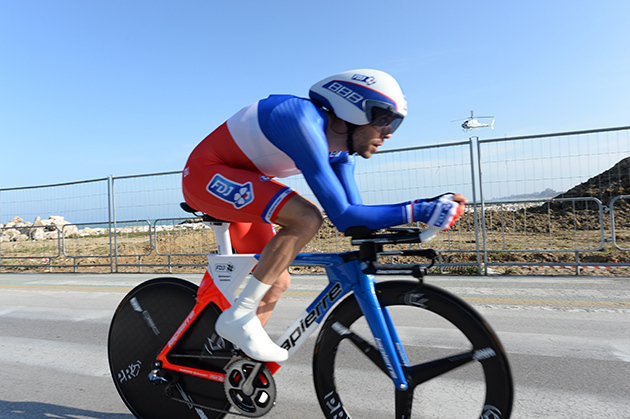 2 Thibaut PINOT FDJ s.t. 3 Primož ROGLIC Lotto NL-Jumbo s.t. 4 Geraint THOMAS Sky s.t. 5 Bauke MOLLEMA Trek-Segafredo s.t. 6 Rigoberto URAN Cannondale Drapac s.t. 7 Tom DUMOULIN Sunweb s.t. 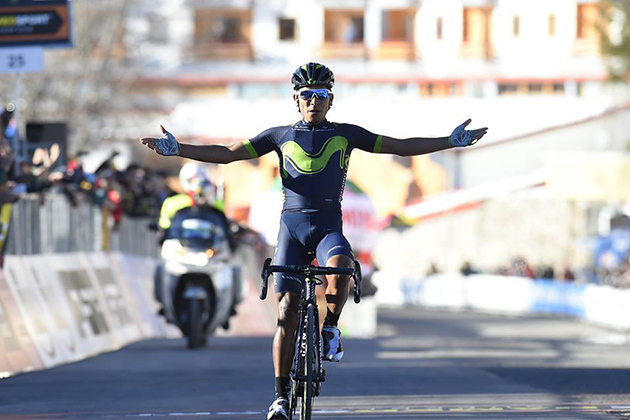 8 Nairo QUINTANA Movistar s.t. 11 Egan Arley BERNAL Androni Giocattoli s.t. 15 Jonathan CASTROVIEJO Movistar s.t. 18 Damiano CARUSO BMC s.t. 19 Jan BAKELANTS Ag2r La Mondiale s.t. 21 Daniel MORENO Movistar s.t. 22 Rui Alberto FARIA DA COSTA UAE Abu Dhabi s.t. 24 Luis León SANCHEZ Astana s.t. 25 Greg VAN AVERMAET BMC s.t. 26 Zdenek ŠTYBAR Quick-Step s.t. 28 Mattia CATTANEO Androni Giocattoli s.t. 32 Andrey AMADOR Movistar s.t. 33 Michael HEPBURN Orica-Scott s.t. 35 Matteo TRENTIN Quick-Step s.t. 38 Maxime MONFORT Lotto Soudal s.t. 39 Vincenzo NIBALI Bahrain-Merida s.t. 40 Diego ROSA Sky s.t. 41 Stephen CUMMINGS Dimension Data s.t. 42 Stefan KÜNG BMC s.t. 47 Jasper STUYVEN Trek-Segafredo s.t. 48 Fabio FELLINE Trek-Segafredo s.t. 49 Steve MORABITO FDJ s.t. 50 Enrico BATTAGLIN Lotto NL-Jumbo s.t. 54 Georg PREIDLER Sunweb s.t. 56 Sebastian LANGEVELD Cannondale Drapac s.t. 57 Marcus BURGHARDT Bora-hansgrohe s.t. 58 Tomasz MARCZYNSKI Lotto Soudal s.t. 59 Franco PELLIZOTTI Bahrain-Merida s.t. 60 Daryl IMPEY Orica-Scott s.t. 66 Julien VERMOTE Quick-Step s.t. 67 Iljo KEISSE Quick-Step s.t. 68 Tom BOONEN Quick-Step s.t. 69 Simon CLARKE Cannondale Drapac s.t. 70 Matej MOHORIC UAE Abu Dhabi s.t. 71 Koen DE KORT Trek-Segafredo s.t. 72 Mike TEUNISSEN Sunweb s.t. 73 Andrey ZEITS Astana s.t. 74 Paul MARTENS Lotto NL-Jumbo s.t. 75 Marco MARCATO UAE Abu Dhabi s.t. 76 Pawel POLJANSKI Bora-hansgrohe s.t. 77 Maurits LAMMERTINK Katusha Alpecin s.t. 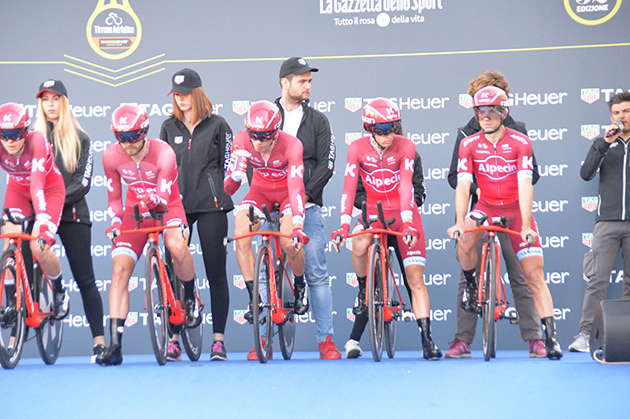 78 Rein TAARAMÄE Katusha Alpecin s.t. 79 Jos VAN EMDEN Lotto NL-Jumbo s.t. 80 Ivan SANTAROMITA Nippo-Vini Fantini s.t. 81 Cesare BENEDETTI Bora-hansgrohe s.t. 82 Scott THWAITES Dimension Data s.t. 85 Vegard Stake LAENGEN UAE Abu Dhabi s.t. 90 Manuel QUINZIATO BMC s.t. 91 Jasha SÜTTERLIN Movistar s.t. 92 Javier MORENO Bahrain-Merida s.t. 93 Jérémy ROY FDJ s.t. 94 Tim WELLENS Lotto Soudal s.t. 96 Ben GASTAUER Ag2r La Mondiale s.t. 97 Bart DE CLERCQ Lotto Soudal s.t. 99 Sacha MODOLO UAE Abu Dhabi s.t. 101 Daniele BENNATI Movistar s.t. 102 Alex DOWSETT Movistar s.t. 103 Dylan VAN BAARLE Cannondale Drapac s.t. 106 Jay Robert THOMSON Dimension Data s.t. 107 Alan MARANGONI Nippo-Vini Fantini s.t. 108 Davide BALLERINI Androni Giocattoli s.t. 109 Marco COLEDAN Trek-Segafredo s.t. 110 Jens DEBUSSCHERE Lotto Soudal s.t. 111 Jurgen ROELANDTS Lotto Soudal s.t. 112 Simone VELASCO Bardiani-CSF s.t. 113 William BONNET FDJ s.t. 114 Bernhard EISEL Dimension Data s.t. 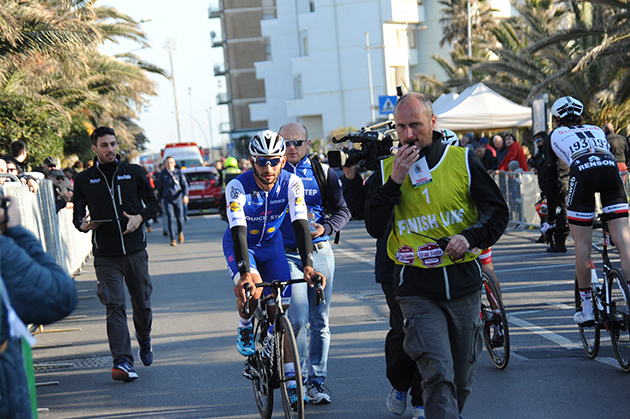 115 Fernando GAVIRIA Quick-Step s.t. 116 Elia VIVIANI Sky s.t. 117 Ramon SINKELDAM Sunweb s.t. 118 Mark RENSHAW Dimension Data s.t. 119 Mark CAVENDISH Dimension Data s.t. 120 David LOZANO RIBA Novo Nordisk s.t. 121 Mattia FRAPPORTI Androni Giocattoli s.t. 122 Kanstantsin SIUTSOU Bahrain-Merida s.t. 123 Andrea PERON Novo Nordisk s.t. 124 Raffaello BONUSI Androni Giocattoli s.t. 125 Ryan MULLEN Cannondale Drapac s.t. 126 Joonas HENTTALA Novo Nordisk s.t. 127 Valerio AGNOLI Bahrain-Merida s.t. 128 Martijn VERSCHOOR Novo Nordisk s.t. 129 ANDREY GRIVKO Astana s.t. 130 Markel IRIZAR Trek-Segafredo s.t. 131 Boy VAN POPPEL Trek-Segafredo s.t. 132 Max WALSCHEID Sunweb s.t. 133 Chad HAGA Sunweb s.t. 134 Matvey MAMYKIN Katusha Alpecin s.t. 135 Maciej BODNAR Bora-hansgrohe s.t. 136 Mirco MAESTRI Bardiani-CSF s.t. 137 Javier MEGIAS LEAL Novo Nordisk s.t. 139 Juan Jose LOBATO Lotto NL-Jumbo s.t. 140 Luka MEZGEC Orica-Scott s.t. 141 Alexandre GENIEZ Ag2r La Mondiale s.t. 142 Alexis GOUGEARD Ag2r La Mondiale s.t. 143 Albert TIMMER Sunweb s.t. 144 Eduard Michael GROSU Nippo-Vini Fantini s.t. 145 Nicola BOEM Bardiani-CSF s.t. 146 Matteo PELUCCHI Bora-hansgrohe s.t. 147 Matthias BRÄNDLE Trek-Segafredo s.t. 148 Enrico BARBIN Bardiani-CSF s.t. 149 Andrea PALINI Androni Giocattoli s.t. 150 Kohei UCHIMA Nippo-Vini Fantini s.t. 151 Simone ANDREETTA Bardiani-CSF s.t. 152 Sep VANMARCKE Cannondale Drapac s.t. 153 Aleksejs SARAMOTINS Bora-hansgrohe s.t. 154 Luca WACKERMANN Bardiani-CSF s.t. 155 Nicola RUFFONI Bardiani-CSF s.t. 156 Filippo GANNA UAE Abu Dhabi s.t. 157 Marco CANOLA Nippo-Vini Fantini s.t. 158 Roberto FERRARI UAE Abu Dhabi s.t. 159 Daniel OSS BMC s.t. 20 Sébastien REICHENBACH FDJ s.t. 71 Matthieu LADAGNOUS FDJ s.t. 78 Stephen CUMMINGS Dimension Data s.t. 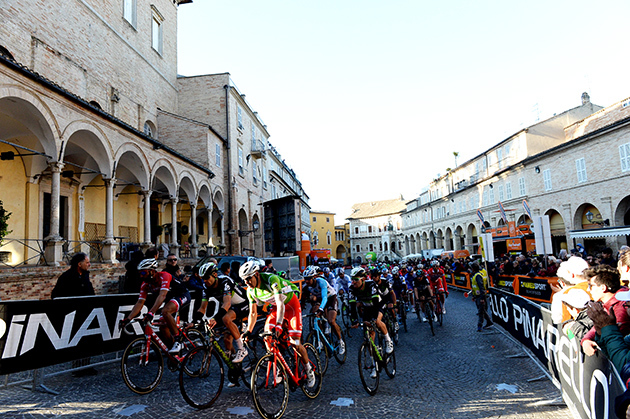 The peloton enters the town of Fermo. 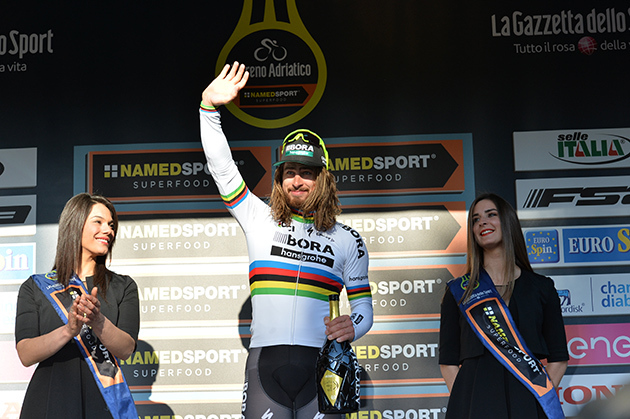 Peter Sagan can be seen in his white/rainbow jersey. 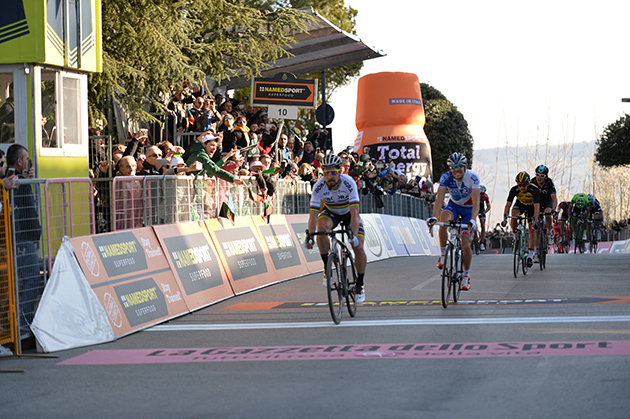 Sirotti caught Sagan just as he crossed the line a little ahead of Thibaut Pinot. The race: here's the story from 3rd place Adam Yates' Orica-Scott team. 2017 GP Larciano winner Adam Yates produced another fantastic performance for Orica-Scott today, climbing into third place on stage four of Tirreno Adriatico to move into second on the general classification and also the best young riders white jersey. One climb dominated the make up of today’s Queen stage and the anticipated battle on the slopes of the Terminnillo did not disappoint. 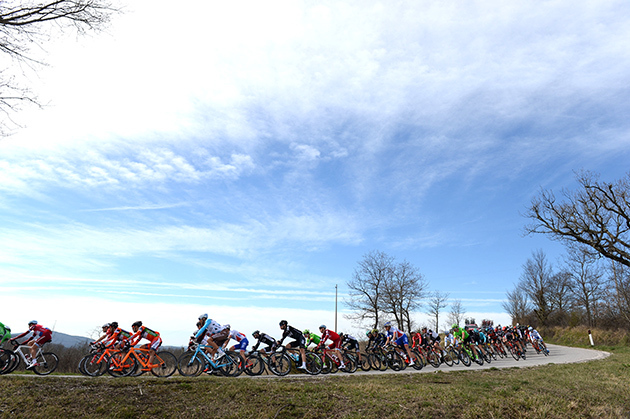 After the early breakaway had been caught a selection of race favourites formed inside the final 15kilometres and the attacks duly started to spring. Yates, supported by Roman Kreuziger and Luke Durbridge until the last six kilometres was riding strongly and after thinning the group out with a punchy attack rode away with an elite group of less than ten riders. 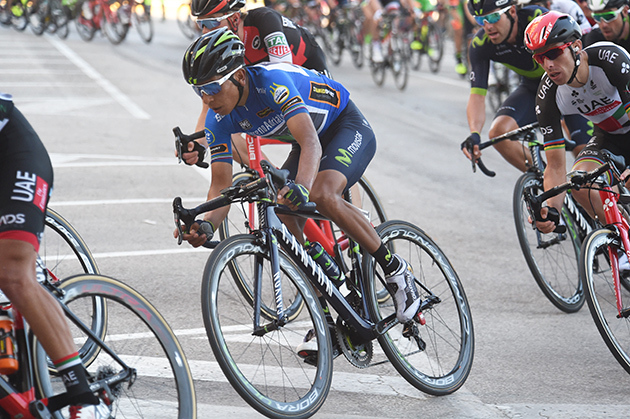 Over the last couple of kilometres Nairo Quintana (Movistar) unleashed a series of devastating attacks and rode away to the stage win with Yates brilliantly holding his own and pushing on for third place and the podium. “Roman and Luke stayed up there with Adam until the last few kilometres, with Roman policing any attacks and Luke, who is climbing very strongly at the moment, taking a couple of big turns at the front to bring things back together again. From there it was up to Adam and he didn’t disappoint, especially when you consider that today was only Adam’s eighth race day of 2017 and the first real sustained climb of the season. The Terminillo stage had finally arrived and another beautiful Italian morning welcomed the riders to the start in Montalto di Castro. A group of six riders skipped off the front in the first 20kilometres and formed the first break of the day. 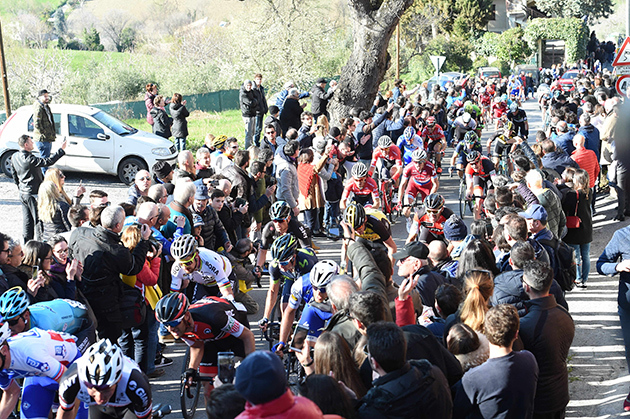 The peloton were happy to let the move go and after 65kilometres of racing the six leaders had a ten-minute advantage as they started up the first climb of the day, La Colonetta. Working well together throughout the mid section of the stage, the breakaway were still over seven minutes ahead as they entered the final 50 kilometres with the brutal Termnillo climb looming ahead. The race hit a long descent with 30kilometres to go as Sunweb started to up the pace in the bunch, immediately reducing the gap to the leaders to within four minutes. As the climb began only one rider remained out front at 50seconds, but not for much longer. 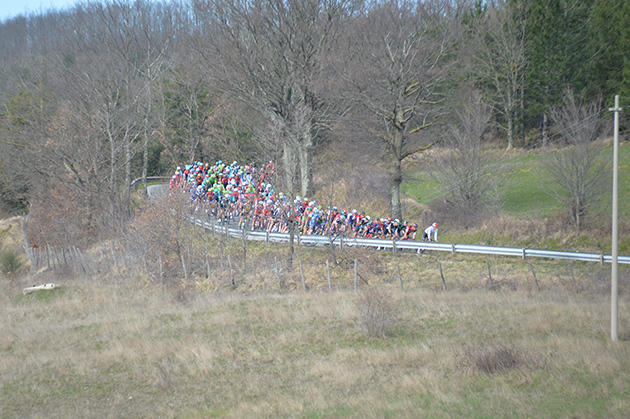 The peloton split as the climb intensified with the general classification teams forming the selection. Kreuziger followed an attack by Michael Kwiatkowski (Team-Sky) with 12kilometres to go and made up a group of five alongside Simon Spilak (Katusha-Alpecin) and Johnathan Castroviejo (Movistar). Inside the last ten kilometres and five became two as Kreuziger dropped back into the favourites group alongside Durbridge and Yates, leaving only Kwiatkowski and Spilak at 50seconds. Attacks continued to fly and with four kilometres remaining a strong acceleration from Yates split the group completely leaving less than ten riders behind the leading duo. Quintana passed Spilak at two kilometres and accelerated away to win the stage as Yates chased valiantly behind and into third on the stage and second in the provisional standings. 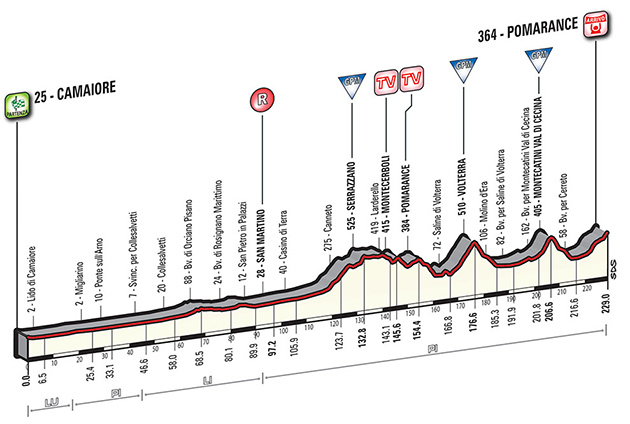 Tomorrow’s stage five is a tough one and covers 210kilometres from Rieti to Fermo on the Adriatic coast. Lots of sharp climbs and technical descents fill the course before an uphill finish that starts with ramps reaching 22%. 4 Rigoberto URAN Cannondale Drapac s.t. 7 Domenico POZZOVIVO Ag2r La Mondiale s.t. 11 Bauke MOLLEMA Trek-Segafredo s.t. 12 Jonathan CASTROVIEJO Movistar s.t. 16 Daniel MORENO Movistar s.t. 21 Fabio FELLINE Trek-Segafredo s.t. 22 Andrey AMADOR Movistar s.t. 23 Luis León SANCHEZ Astana s.t. 24 Vincenzo NIBALI Bahrain-Merida s.t. 26 Michal KWIATKOWSKI Sky s.t. 27 Robert GESINK Lotto NL-Jumbo s.t. 31 Vegard Stake LAENGEN UAE Abu Dhabi s.t. 34 Franco PELLIZOTTI Bahrain-Merida s.t. 36 Matteo MONTAGUTI Ag2r La Mondiale s.t. 38 Pavel KOCHETKOV Katusha Alpecin s.t. 39 Maurits LAMMERTINK Katusha Alpecin s.t. 44 Tim WELLENS Lotto Soudal s.t. 46 Luke DURBRIDGE Orica-Scott s.t. 47 Ben GASTAUER Ag2r La Mondiale s.t. 48 Jan BAKELANTS Ag2r La Mondiale s.t. 50 Maxime MONFORT Lotto Soudal s.t. 53 Gianni MOSCON Sky s.t. 55 Kanstantsin SIUTSOU Bahrain-Merida s.t. 56 Javier MORENO Bahrain-Merida s.t. 57 Bart DE CLERCQ Lotto Soudal s.t. 60 Matvey MAMYKIN Katusha Alpecin s.t. 61 Davide BALLERINI Androni Giocattoli s.t. 62 Raffaello BONUSI Androni Giocattoli s.t. 63 Søren Kragh ANDERSEN Sunweb s.t. 64 Simone VELASCO Bardiani-CSF s.t. 65 Enrico BATTAGLIN Lotto NL-Jumbo s.t. 66 Francesco GAVAZZI Androni Giocattoli s.t. 67 Ángel VICIOSO ARCOS Katusha Alpecin s.t. 68 Alexandre GENIEZ Ag2r La Mondiale s.t. 69 Marcus BURGHARDT Bora-hansgrohe s.t. 71 Tomasz MARCZYNSKI Lotto Soudal s.t. 72 Daryl IMPEY Orica-Scott s.t. 74 Zdenek ŠTYBAR Quick-Step s.t. 75 Michael HEPBURN Orica-Scott s.t. 76 Gediminas BAGDONAS Ag2r La Mondiale s.t. 78 Marco FRAPPORTI Androni Giocattoli s.t. 79 Koen DE KORT Trek-Segafredo s.t. 80 Mike TEUNISSEN Sunweb s.t. 81 Anthony ROUX FDJ s.t. 84 Matthieu LADAGNOUS FDJ s.t. 85 Alexis GOUGEARD Ag2r La Mondiale s.t. 86 Greg VAN AVERMAET BMC s.t. 89 Niki TERPSTRA Quick-Step s.t. 90 Tom BOONEN Quick-Step s.t. 91 Iljo KEISSE Quick-Step s.t. 92 Joonas HENTTALA Novo Nordisk s.t. 93 Tiesj BENOOT Lotto Soudal s.t. 94 Ryan MULLEN Cannondale Drapac s.t. 95 Dylan VAN BAARLE Cannondale Drapac s.t. 96 Rick ZABEL Katusha Alpecin s.t. 97 Cesare BENEDETTI Bora-hansgrohe s.t. 98 Markel IRIZAR Trek-Segafredo s.t. 99 Jurgen ROELANDTS Lotto Soudal s.t. 100 Jens DEBUSSCHERE Lotto Soudal s.t. 101 Alex DOWSETT Movistar s.t. 102 Jos VAN EMDEN Lotto NL-Jumbo s.t. 103 Mattia FRAPPORTI Androni Giocattoli s.t. 104 Paul MARTENS Lotto NL-Jumbo s.t. 105 Mark CAVENDISH Dimension Data s.t. 106 Stefan KÜNG BMC s.t. 107 Marco MARCATO UAE Abu Dhabi s.t. 108 Stephen CUMMINGS Dimension Data s.t. 109 Aleksejs SARAMOTINS Bora-hansgrohe s.t. 110 Sebastian LANGEVELD Cannondale Drapac s.t. 111 William BONNET FDJ s.t. 112 Dmitriy GRUZDEV Astana s.t. 113 Luca WACKERMANN Bardiani-CSF s.t. 114 Mirco MAESTRI Bardiani-CSF s.t. 118 Daniele BENNATI Movistar s.t. 119 Maciej BODNAR Bora-hansgrohe s.t. 121 Juan Jose LOBATO Lotto NL-Jumbo s.t. 122 Lars BOOM Lotto NL-Jumbo s.t. 123 Boy VAN POPPEL Trek-Segafredo s.t. 125 Alberto BETTIOL Cannondale Drapac s.t. 126 Eduard Michael GROSU Nippo-Vini Fantini s.t. 128 Marco COLEDAN Trek-Segafredo s.t. 131 Daniel OSS BMC s.t. 134 Oscar GATTO Astana s.t. 135 Ramon SINKELDAM Sunweb s.t. 136 Moreno MOSER Astana s.t. 137 Alan MARANGONI Nippo-Vini Fantini s.t. 138 Jérémy ROY FDJ s.t. 139 Martijn VERSCHOOR Novo Nordisk s.t. 140 Andrea PERON Novo Nordisk s.t. 141 Mark RENSHAW Dimension Data s.t. 142 Marko KUMP UAE Abu Dhabi s.t. 143 Luka MEZGEC Orica-Scott s.t. 144 Matteo PELUCCHI Bora-hansgrohe s.t. 145 Max WALSCHEID Sunweb s.t. 146 Ivan SANTAROMITA Nippo-Vini Fantini s.t. 147 Fabio CALABRIA Novo Nordisk s.t. 148 Hideto NAKANE Nippo-Vini Fantini s.t. 149 Johann VAN ZYL Dimension Data s.t. 150 Manuele BOARO Bahrain-Merida s.t. 151 ANDREY GRIVKO Astana s.t. 152 Marco CANOLA Nippo-Vini Fantini s.t. 153 Iuri FILOSI Nippo-Vini Fantini s.t. 154 David LOZANO RIBA Novo Nordisk s.t. 155 Simone ANDREETTA Bardiani-CSF s.t. 156 Charles PLANET Novo Nordisk s.t. 157 Kohei UCHIMA Nippo-Vini Fantini s.t. 158 Fernando GAVIRIA Quick-Step s.t. 159 Javier MEGIAS Novo Nordisk s.t. 160 Albert TIMMER Sunweb s.t. 161 Enrico BARBIN Bardiani-CSF s.t. 162 Nicola BOEM Bardiani-CSF s.t. 163 Roberto FERRARI UAE Abu Dhabi s.t. 164 Elia VIVIANI Sky s.t. 165 Filippo GANNA UAE Abu Dhabi s.t. 166 Ramunas NAVARDAUSKAS Bahrain-Merida s.t. 167 Andrea PALINI Androni Giocattoli s.t. 7 Primož ROGLIC Lotto NL-Jumbo s.t. 16 Andrey AMADOR Movistar s.t. 163 Fabio CALABRIA Novo Nordisk s.t. 164 David LOZANO RIBA Novo Nordisk s.t. 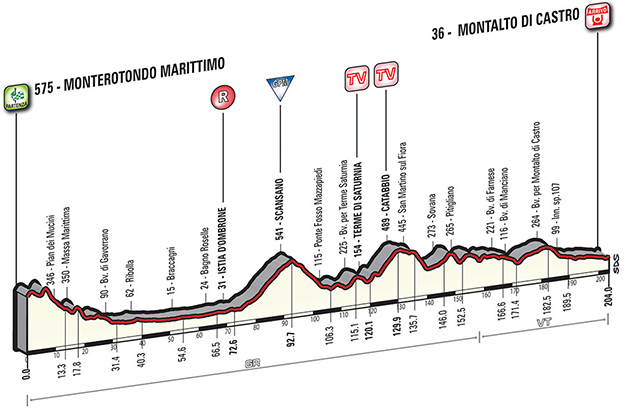 Weather at the finish town of Montalto di Castro at 2:50 PM, local time: Sunny and windy, 21C (70F) with the wind from the NNE at 34 km/hr (21 mph). 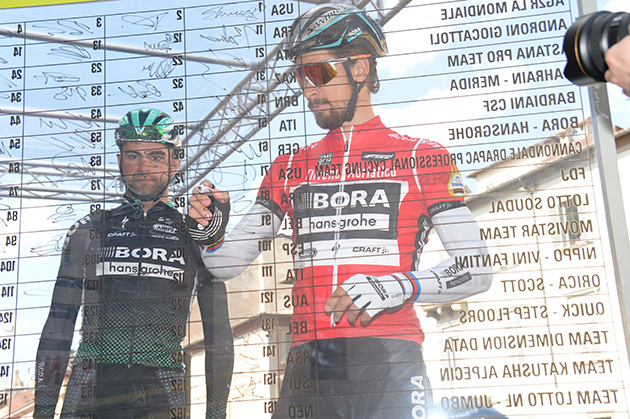 The race: Here's the summary from stage winner Peter Sagan's Bora-hansgrohe team. 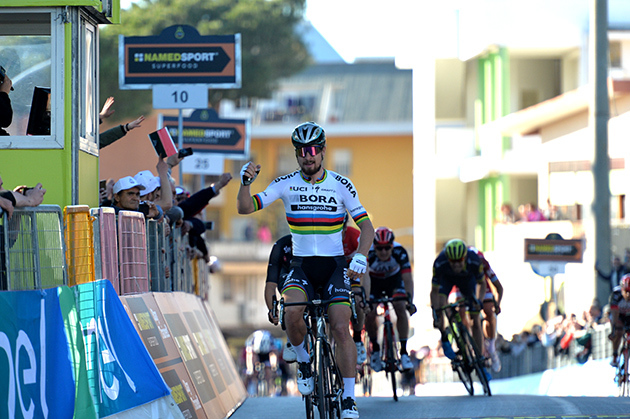 After holding back on yesterday’s finish, there was no stopping the UCI World Champion, Peter Sagan, in today’s finale. With breakneck speeds in the peloton in the final 10km, the BORA-hansgrohe riders drove the pace high and brought the Slovak rider to another win – making it look easy as only Peter can. 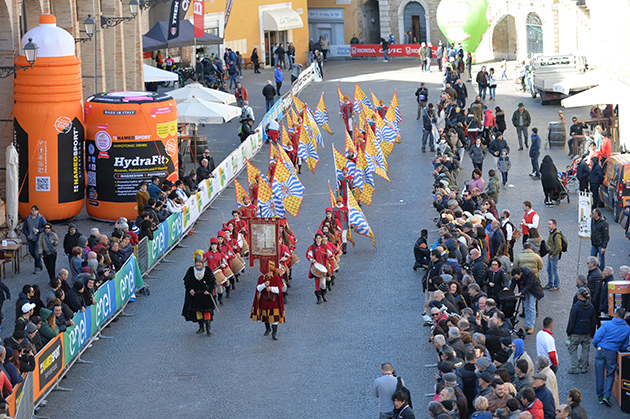 A long descent eased riders into the day’s racing – with the parcours pointing downward for most of the first 40km of the stage, before a flat run in to the first climb. 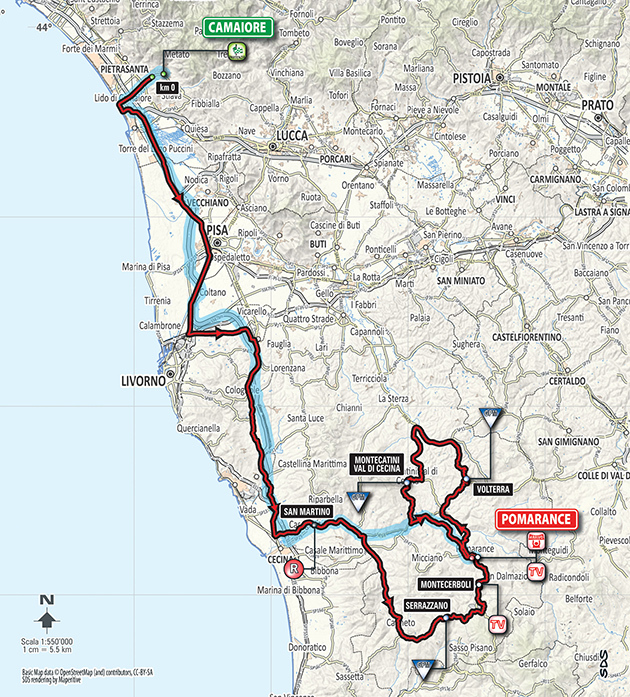 With the easy part over, it was undulating for the remainder of the 204km stage, with two categorised climbs to cross before the ride to the finish in Montaldo di Castro. The flat finale was earmarked for the fast men, but a kick at the finish still had the potential to trouble the out and out sprinters. With the expected bunch sprint finish, the teams of the fast men were more relaxed when the break went up the road early on in the day. 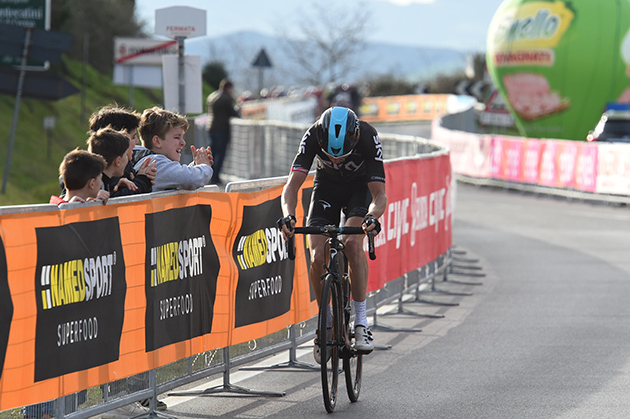 With some climbs before the run in to the finish, there was plenty of time to make the catch and lay claim to the stage win – the gap rising to more than three minutes and holding steady for much of the stage. With the efforts of the climbs kicking in however, the break started to fade – the day’s intermediate sprint points already mopped up, it was unlikely the escape was going to last until the end. With 25km remaining, the gap had shrunk to just 15 seconds, the BORA-hansgrohe riders ramping up the pace in preparation for the finale. Just before the 15km mark, the catch was well and truly made, with the chasing peloton reaching incredible speeds as the sprint teams worked to deliver their rider to the line. 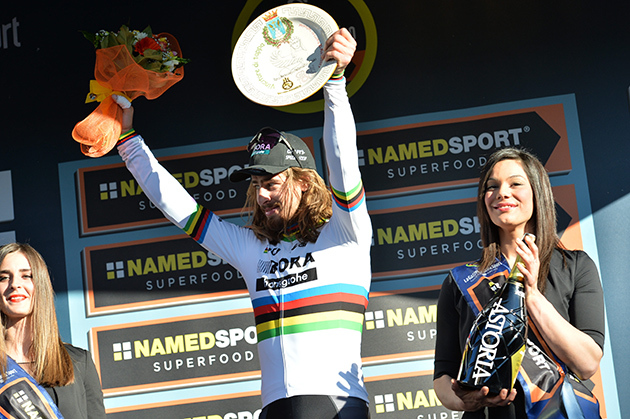 Throughout the finale, it was clear that the UCI World Champion, Peter Sagan, was in complete control, his teammates took charge of the peloton and driving the pace to a speed only the Slovak could maintain. Blasting past the remainder of the field, there was no doubting who was going to take the win today. Peter took the win – making it look like his rivals were standing still. 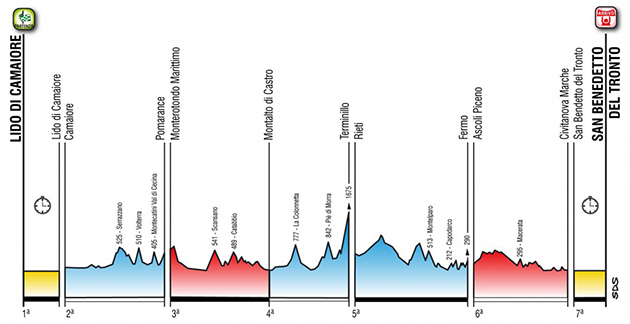 A shorter stage awaits riders on Saturday, but this is by no means an easy day – quite the opposite. 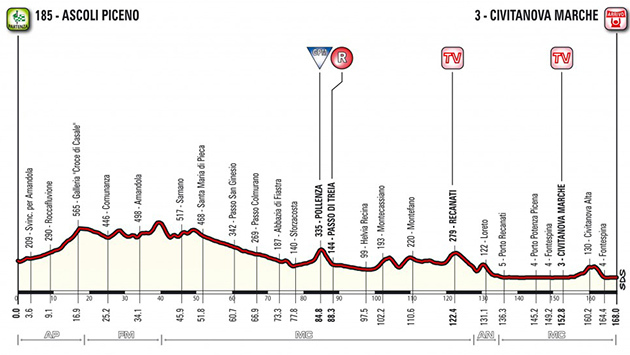 The race’s Queen Stage is a comparatively short 187km in length, but sees two tough categorised climbs before the summit finish in Terminillo. 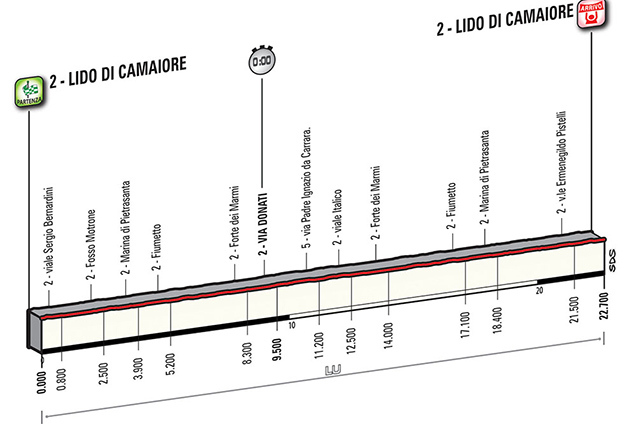 This stage will be the one where the GC riders will really look to make their presence felt. 2 Elia VIVIANI Sky s.t. 3 Jurgen ROELANDTS Lotto Soudal s.t. 4 Sacha MODOLO UAE Abu Dhabi s.t. 5 Luka MEZGEC Orica-Scott s.t. 6 Rick ZABEL Katusha Alpecin s.t. 7 Andrea PALINI Androni Giocattoli s.t. 8 Roberto FERRARI UAE Abu Dhabi s.t. 9 Georg PREIDLER Sunweb s.t. 10 Ramon SINKELDAM Sunweb s.t. 11 Geraint THOMAS Sky s.t. 12 Koen DE KORT Trek-Segafredo s.t. 14 Anthony ROUX FDJ s.t. 15 Marko KUMP UAE Abu Dhabi s.t. 16 Søren Kragh ANDERSEN Sunweb s.t. 17 Fabio ARU Astana s.t. 18 Ramunas NAVARDAUSKAS Bahrain-Merida s.t. 19 Matteo TRENTIN Quick-Step s.t. 20 Mike TEUNISSEN Sunweb s.t. 21 Michal KWIATKOWSKI Sky s.t. 22 Jos VAN EMDEN Lotto NL-Jumbo s.t. 23 Jens DEBUSSCHERE Lotto Soudal s.t. 24 Rohan DENIS BMC s.t. 25 Rui Alberto FARIA DA COSTA UAE Abu Dhabi s.t. 26 Marco COLEDAN Trek-Segafredo s.t. 27 Mark CAVENDISH Dimension Data s.t. 28 Vincenzo NIBALI Bahrain-Merida s.t. 29 Tom DUMOULIN Sunweb s.t. 30 Edvald BOASSON HAGEN Dimension Data s.t. 31 Tiesj BENOOT Lotto Soudal s.t. 32 Ryan MULLEN Cannondale Drapac s.t. 34 Stefan KÜNG BMC s.t. 35 Damiano CARUSO BMC s.t. 36 Andrey ZEITS Astana s.t. 37 Pawel POLJANSKI Bora-hansgrohe s.t. 38 Roman KREUZIGER Orica-Scott s.t. 39 Andrey AMADOR Movistar s.t. 40 Robert GESINK Lotto NL-Jumbo s.t. 41 Nelson OLIVEIRA Movistar s.t. 42 Nairo QUINTANA Movistar s.t. 44 Simon ŠPILAK Katusha Alpecin s.t. 45 Primož ROGLIC Lotto NL-Jumbo s.t. 46 Manuel QUINZIATO BMC s.t. 47 Tejay VAN GARDEREN BMC s.t. 48 Mark RENSHAW Dimension Data s.t. 49 Enrico BATTAGLIN Lotto NL-Jumbo s.t. 50 Rafal MAJKA Bora-hansgrohe s.t. 51 Aleksejs SARAMOTINS Bora-hansgrohe s.t. 52 Domenico POZZOVIVO Ag2r La Mondiale s.t. 53 Egan Arley BERNAL GOMEZ Androni Giocattoli s.t. 54 Scott THWAITES Dimension Data s.t. 55 Rigoberto URAN URAN Cannondale Drapac s.t. 56 Oscar GATTO Astana s.t. 57 Luis León SANCHEZ Astana s.t. 58 Franco PELLIZOTTI Bahrain-Merida s.t. 59 Greg VAN AVERMAET BMC s.t. 60 Jasha SÜTTERLIN Movistar s.t. 61 Vegard Stake LAENGEN UAE Abu Dhabi s.t. 62 Jonathan CASTROVIEJO Movistar s.t. 63 Nikolas MAES Lotto Soudal s.t. 64 Marcus BURGHARDT Bora-hansgrohe s.t. 65 Bernhard EISEL Dimension Data s.t. 66 Enrico BARBIN Bardiani-CSF s.t. 67 Maurits LAMMERTINK Katusha Alpecin s.t. 69 Marco CANOLA Nippo-Vini Fantini s.t. 70 Jan BAKELANTS Ag2r La Mondiale s.t. 71 Manuele BOARO Bahrain-Merida s.t. 72 Giovanni VISCONTI Bahrain-Merida s.t. 73 Hugo HOULE Ag2r La Mondiale s.t. 74 Markel IRIZAR ARANBURU Trek-Segafredo s.t. 75 Tobias LUDVIGSSON FDJ s.t. 76 Jasper STUYVEN Trek-Segafredo s.t. 77 Javier MORENO BAZAN Bahrain-Merida s.t. 78 Alexandre GENIEZ Ag2r La Mondiale s.t. 79 Matthieu LADAGNOUS FDJ s.t. 80 Steve MORABITO FDJ s.t. 81 Jérémy ROY FDJ s.t. 82 Lars BOOM Lotto NL-Jumbo s.t. 83 Daryl IMPEY Orica-Scott s.t. 84 Maxime MONFORT Lotto Soudal s.t. 85 Daniel MORENO Movistar s.t. 86 Mattia CATTANEO Androni Giocattoli s.t. 87 Dylan VAN BAARLE Cannondale Drapac s.t. 88 Chad HAGA Sunweb s.t. 89 Thibaut PINOT FDJ s.t. 90 William BONNET FDJ s.t. 91 Michele SCARPONI Astana s.t. 92 Sébastien REICHENBACH FDJ s.t. 93 Boy VAN POPPEL Trek-Segafredo s.t. 94 Adam YATES Orica-Scott s.t. 95 Luke DURBRIDGE Orica-Scott s.t. 97 Dmitriy GRUZDEV Astana s.t. 98 Salvatore PUCCIO Sky s.t. 99 Gianni MOSCON Sky s.t. 100 Vasil KIRYIENKA Sky s.t. 101 Niki TERPSTRA Quick-Step s.t. 102 Sep VANMARCKE Cannondale Drapac s.t. 103 Sebastian LANGEVELD Cannondale Drapac s.t. 104 Raffaello BONUSI Androni Giocattoli s.t. 106 Michael HEPBURN Orica-Scott s.t. 116 Valerio AGNOLI Bahrain-Merida s.t. 117 Bart DE CLERCQ Lotto Soudal s.t. 118 Marco FRAPPORTI Androni Giocattoli s.t. 119 Kanstantsin SIUTSOU Bahrain-Merida s.t. 120 Gediminas BAGDONAS Ag2r La Mondiale s.t. 122 Ivan SANTAROMITA Nippo-Vini Fantini s.t. 123 Hideto NAKANE Nippo-Vini Fantini s.t. 124 Simone ANDREETTA Bardiani-CSF s.t. 128 Ángel VICIOSO ARCOS Katusha Alpecin s.t. 129 Rein TAARAMÄE Katusha Alpecin s.t. 130 Paul MARTENS Lotto NL-Jumbo s.t. 131 Cesare BENEDETTI Bora-hansgrohe s.t. 142 Jean-Pierre DRUCKER BMC s.t. 151 Patrick BEVIN Cannondale Drapac s.t. 152 Nicola RUFFONI Bardiani-CSF s.t. 153 Simone VELASCO Bardiani-CSF s.t. 154 Andrea PERON Novo Nordisk s.t. 155 Matteo PELUCCHI Bora-hansgrohe s.t. 156 Max WALSCHEID Sunweb s.t. 157 Charles PLANET Novo Nordisk s.t. 158 Alan MARANGONI Nippo-Vini Fantini s.t. 159 Mattia FRAPPORTI Androni Giocattoli s.t. 160 Martijn VERSCHOOR Novo Nordisk s.t. 161 David LOZANO RIBA Novo Nordisk s.t. 162 Moreno MOSER Astana s.t. 164 Romain GIOUX Novo Nordisk s.t. 165 Mirco MAESTRI Bardiani-CSF s.t. 166 Stephen CUMMINGS Dimension Data s.t. 167 Filippo GANNA UAE Abu Dhabi s.t. 168 Matvey MAMYKIN Katusha Alpecin s.t. 169 Alex DOWSETT Movistar s.t. 170 Kohei UCHIMA Nippo-Vini Fantini s.t. 3 Damiano CARUSO BMC s.t. 6 Bob JUNGELS Quick-Step s.t. 8 Andrey AMADOR Movistar s.t. 10 Daniel MORENO Movistar s.t. 11 Sébastien REICHENBACH FDJ s.t. 12 Thibaut PINOT FDJ s.t. 15 Robert GESINK Lotto NL-Jumbo s.t. 19 Vincenzo NIBALI Bahrain-Merida s.t. 21 Luis León SANCHEZ Astana s.t. 26 Fabio FELLINE Trek-Segafredo s.t. 28 Alexandre GENIEZ Ag2r La Mondiale s.t. 34 Rigoberto URAN URAN Cannondale Drapac s.t. 35 Matej MOHORIC UAE Abu Dhabi s.t. 41 Mattia CATTANEO Androni Giocattoli s.t. 46 Anthony ROUX FDJ s.t. 48 Fernando GAVIRIA Quick-Step s.t. 55 Tomasz MARCZYNSKI Lotto Soudal s.t. 57 Javier MORENO BAZAN Bahrain-Merida s.t. 67 Diego ROSA Sky s.t. 78 Jasha SÜTTERLIN Movistar s.t. 94 Matthias BRÄNDLE Trek-Segafredo s.t. 100 Daniele BENNATI Movistar s.t. 116 Hideto NAKANE Nippo-Vini Fantini s.t. 142 Iljo KEISSE Quick-Step s.t. 166 Martijn VERSCHOOR Novo Nordisk s.t. 167 David LOZANO RIBA Novo Nordisk s.t. 168 Fabio CALABRIA Novo Nordisk s.t. Peter Sagan dives for the line. Peter Sagan enjoys his win. 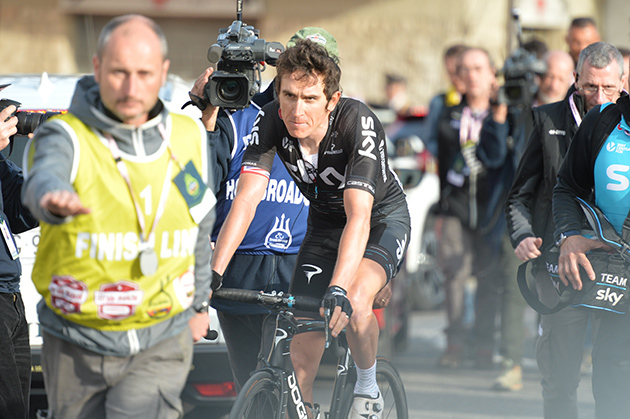 The race: here's the report from stage winner Geraint Thomas' Sky team. 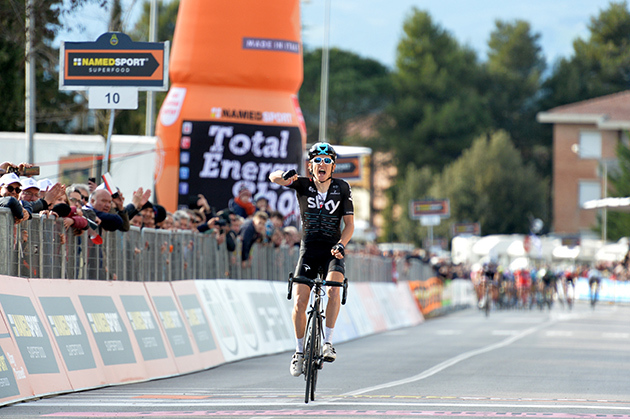 Geraint Thomas sealed a superb late breakaway victory to win stage two of Tirreno-Adriatico in Pomarance. Thomas broke free of a group containing Nairo Quintana (Movistar), Bob Jungels (Quick-Step Floors) and Damiano Caruso (BMC Racing) with just over one kilometre to go and was able to hold off the chasing pack to record his first win of 2017. An earlier breakaway of six riders had threatened to take the stage away from the GC contenders, but strong work from Team Sky, in particular a bandaged Gianni Moscon, on the front of the peloton brought the race together with 27km to go. Vasil Kiryienka then played a vital role, stringing out the bunch ahead of the final ascent with an impressive turn at the head of the peloton which allowed Thomas, Salvatore Puccio, Michal Kwiatkowski and Diego Rosa to make their way to the front of an elite group. Thomas then attacked again to create a smaller break of four, which he left behind with 1.6km to go to round off a superb team performance. After the disappointment of the opening stage’s team time trial, Thomas was delighted with the team’s response. He said: “Obviously it wasn't a good day yesterday but I was feeling good today and we just wanted to attack the stage. We know every day we have the chance to win stages now so we thought let's just race each day full gas. The Welshman has not raced since January, having recently been training in South Africa, but was delighted with his performance. He added: “I’ve been feeling good in training. I haven't raced since Tour Down Under, so coming here I was a bit unsure with the race rhythm, sitting in the bunch and fighting for position. “But obviously winning today I must be going okay! I'm definitely on track and just excited about racing different races and being back in Italy. It's where I started with Barloworld, living in Tuscany, so it's really nice to be racing here again. "We wanted to be in a good position going into the steep part of the climb. I was feeling pretty good. When Bob (Jungels) attacked initially I followed him. I didn't think the move was going to stick until maybe 150 metres to go. I've been working hard since November it's really nice to get that win." 4 Greg VAN AVERMAET BMC s.t. 5 Francesco GAVAZZI Androni Giocattoli s.t. 6 Michal KWIATKOWSKI Sky s.t. 7 Adam YATES Orica-Scott s.t. 8 Rohan DENIS BMC s.t. 9 Nairo QUINTANA Movistar s.t. 10 Simon CLARKE Cannondale Drapac s.t. 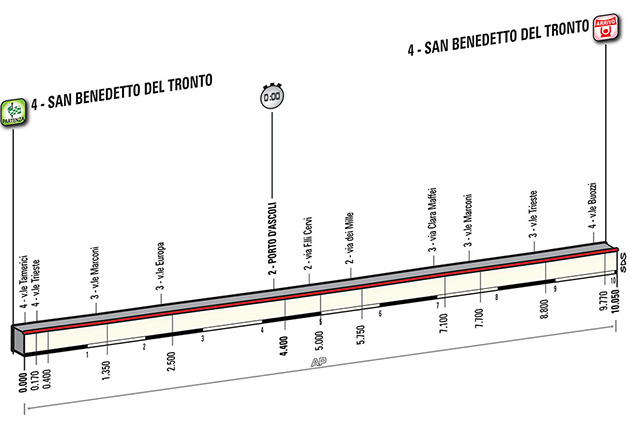 11 Fabio FELLINE Trek-Segafredo s.t. 12 Daniel MORENO Movistar s.t. 14 Edvald BOASSON HAGEN Dimension Data s.t. 15 Primož ROGLIC Lotto NL-Jumbo s.t. 17 Vincenzo NIBALI Bahrain-Merida s.t. 19 Egan Arley BERNAL GOMEZ Androni Giocattoli s.t. 20 Luis León SANCHEZ Astana s.t. 21 Rigoberto URAN URAN Cannondale Drapac s.t. 22 Niki TERPSTRA Quick-Step s.t. 23 Sébastien REICHENBACH FDJ s.t. 24 Fabio ARU Astana s.t. 25 Jonathan CASTROVIEJO Movistar s.t. 26 Robert GESINK Lotto NL-Jumbo s.t. 27 Tejay VAN GARDEREN BMC s.t. 28 Mikel LANDA MEANA Sky s.t. 29 Roman KREUZIGER Orica-Scott s.t. 30 Søren Kragh ANDERSEN Sunweb s.t. 31 Damiano CARUSO BMC s.t. 32 Thibaut PINOT FDJ s.t. 33 Andrey AMADOR BIKKAZAKOVA Movistar s.t. 34 Bob JUNGELS Quick-Step s.t. 35 Alexandre GENIEZ Ag2r La Mondiale s.t. 37 Tim WELLENS Lotto Soudal s.t. 38 Vegard Stake LAENGEN UAE Abu Dhabi s.t. 39 Diego ROSA Sky s.t. 40 Mattia CATTANEO Androni Giocattoli s.t. 41 Michele SCARPONI Astana s.t. 42 Rui Alberto FARIA DA COSTA UAE Abu Dhabi s.t. 44 Giovanni VISCONTI Bahrain-Merida s.t. 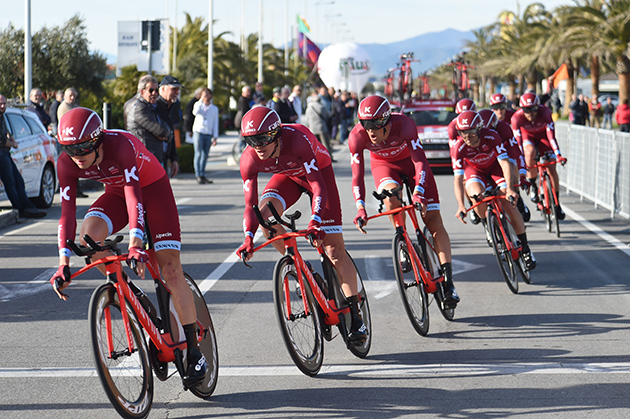 51 Reto HOLLENSTEIN Katusha Alpecin s.t. 52 Tobias LUDVIGSSON FDJ s.t. 53 Luke DURBRIDGE Orica-Scott s.t. 54 Marcus BURGHARDT Bora-hansgrohe s.t. 57 Pavel KOCHETKOV Katusha Alpecin s.t. 58 Anthony ROUX FDJ s.t. 62 Matteo TRENTIN Quick-Step s.t. 63 Marco MARCATO UAE Abu Dhabi s.t. 64 Bart DE CLERCQ Lotto Soudal s.t. 65 Tomasz MARCZYNSKI Lotto Soudal s.t. 66 Enrico BATTAGLIN Lotto NL-Jumbo s.t. 67 Salvatore PUCCIO Sky s.t. 68 Javier MORENO BAZAN Bahrain-Merida s.t. 69 Steve MORABITO FDJ s.t. 70 Maciej BODNAR Bora-hansgrohe s.t. 71 Fernando GAVIRIA RENDON Quick-Step s.t. 72 Jan BAKELANTS Ag2r La Mondiale s.t. 73 Scott THWAITES Dimension Data s.t. 74 Stephen CUMMINGS Dimension Data s.t. 76 Chad HAGA Sunweb s.t. 78 Zdenek ŠTYBAR Quick-Step s.t. 79 Mike TEUNISSEN Sunweb s.t. 80 Cesare BENEDETTI Bora-hansgrohe s.t. 83 Ivan SANTAROMITA Nippo-Vini Fantini s.t. 84 Daniele BENNATI Movistar s.t. 85 Iuri FILOSI Nippo-Vini Fantini s.t. 86 Hideto NAKANE Nippo-Vini Fantini s.t. 87 Kanstantsin SIUTSOU Bahrain-Merida s.t. 88 Nelson OLIVEIRA Movistar s.t. 89 Maxime MONFORT Lotto Soudal s.t. 90 Ángel VICIOSO ARCOS Katusha Alpecin s.t. 91 Matthieu LADAGNOUS FDJ s.t. 92 ANDREY GRIVKO Astana s.t. 93 Enrico BARBIN Bardiani-CSF s.t. 94 Daryl IMPEY Orica-Scott s.t. 95 Sebastian LANGEVELD Cannondale Drapac s.t. 96 Jasha SÜTTERLIN Movistar s.t. 100 Rick ZABEL Katusha Alpecin s.t. 101 Patrick BEVIN Cannondale Drapac s.t. 102 Alan MARANGONI Nippo-Vini Fantini s.t. 103 Michael HEPBURN Orica-Scott s.t. 104 Matvey MAMYKIN Katusha Alpecin s.t. 105 Maurits LAMMERTINK Katusha Alpecin s.t. 106 Simone VELASCO Bardiani-CSF s.t. 107 Davide BALLERINI Androni Giocattoli s.t. 108 Nikolas MAES Lotto Soudal s.t. 109 Julien VERMOTE Quick-Step s.t. 110 Tom BOONEN Quick-Step s.t. 111 Joonas HENTTALA Novo Nordisk s.t. 112 Mattia FRAPPORTI Androni Giocattoli s.t. 113 Markel IRIZAR ARANBURU Trek-Segafredo s.t. 114 Simone ANDREETTA Bardiani-CSF s.t. 115 Jay Robert THOMSON Dimension Data s.t. 116 Marco FRAPPORTI Androni Giocattoli s.t. 117 Luka MEZGEC Orica-Scott s.t. 118 Johann VAN ZYL Dimension Data s.t. 119 Bernhard EISEL Dimension Data s.t. 120 Elia VIVIANI Sky s.t. 121 Juan Jose LOBATO DEL VALLE Lotto NL-Jumbo s.t. 122 Daniel OSS BMC s.t. 123 Manuele BOARO Bahrain-Merida s.t. 124 Julian David ARREDONDO MORENO Nippo-Vini Fantini s.t. 125 Gianni MOSCON Sky s.t. 127 Jos VAN EMDEN Lotto NL-Jumbo s.t. 128 Ramon SINKELDAM Sunweb s.t. 129 Ben GASTAUER Ag2r La Mondiale s.t. 130 Albert TIMMER Sunweb s.t. 131 Hugo HOULE Ag2r La Mondiale s.t. 132 Aleksejs SARAMOTINS Bora-hansgrohe s.t. 133 Matthias BRÄNDLE Trek-Segafredo s.t. 134 Sacha MODOLO UAE Abu Dhabi s.t. 135 Javier MEGIAS LEAL Novo Nordisk s.t. 137 Ramunas NAVARDAUSKAS Bahrain-Merida s.t. 138 Gediminas BAGDONAS Ag2r La Mondiale s.t. 139 Dmitriy GRUZDEV Astana s.t. 141 Alex DOWSETT Movistar s.t. 142 Ryan MULLEN Cannondale Drapac s.t. 143 Dylan VAN BAARLE Cannondale Drapac s.t. 144 Sep VANMARCKE Cannondale Drapac s.t. 146 Manuel QUINZIATO BMC s.t. 147 Tiesj BENOOT Lotto Soudal s.t. 148 Matteo PELUCCHI Bora-hansgrohe s.t. 149 Jens DEBUSSCHERE Lotto Soudal s.t. 150 Max WALSCHEID Sunweb s.t. 151 Iljo KEISSE Quick-Step s.t. 152 Andrea PERON Novo Nordisk s.t. 153 Jean-Pierre DRUCKER BMC s.t. 154 Romain GIOUX Novo Nordisk s.t. 155 Eduard Michael GROSU Nippo-Vini Fantini s.t. 156 Martijn VERSCHOOR Novo Nordisk s.t. 157 Fabio CALABRIA Novo Nordisk s.t. 158 Alessandro TONELLI Bardiani-CSF s.t. 159 David LOZANO RIBA Novo Nordisk s.t. 160 Mirco MAESTRI Bardiani-CSF s.t. 161 Paul MARTENS Lotto NL-Jumbo s.t. 162 Mark RENSHAW Dimension Data s.t. 163 Filippo GANNA UAE Abu Dhabi s.t. 164 Nicola RUFFONI Bardiani-CSF s.t. 165 Nicola BOEM Bardiani-CSF s.t. 166 Andrea PALINI Androni Giocattoli s.t. 167 Raffaello BONUSI Androni Giocattoli s.t. 168 Kohei UCHIMA Nippo-Vini Fantini s.t. 169 Marko KUMP UAE Abu Dhabi s.t. 170 Boy VAN POPPEL Trek-Segafredo s.t. 171 Charles PLANET Novo Nordisk s.t. 172 Roberto FERRARI UAE Abu Dhabi s.t. 173 Rein TAARAMÄE Katusha Alpecin s.t. 8 Daniel MORENO Movistar s.t. 10 Jonathan CASTROVIEJO Movistar s.t. 11 Thibaut PINOT FDJ s.t. 12 Andrey AMADOR BIKKAZAKOVA Movistar s.t. 21 Fabio ARU Astana s.t. 27 Alexandre GENIEZ Ag2r La Mondiale s.t. 31 Rui Alberto FARIA DA COSTA UAE Abu Dhabi s.t. 41 Mikel LANDA MEANA Sky s.t. 42 Diego ROSA Sky s.t. 44 Egan Arley BERNAL GOMEZ Androni Giocattoli s.t. 45 Mattia CATTANEO Androni Giocattoli s.t. 50 Anthony ROUX FDJ s.t. 52 Fernando GAVIRIA RENDON Quick-Step s.t. 59 Tomasz MARCZYNSKI Lotto Soudal s.t. 61 Javier MORENO BAZAN Bahrain-Merida s.t. 62 Scott THWAITES Dimension Data s.t. 63 Stephen CUMMINGS Dimension Data s.t. 81 Matthieu LADAGNOUS FDJ s.t. 82 Jasha SÜTTERLIN Movistar s.t. 89 ANDREY GRIVKO Astana s.t. 95 Tom BOONEN Quick-Step s.t. 98 Luka MEZGEC Orica-Scott s.t. 102 Iuri FILOSI Nippo-Vini Fantini s.t. 103 Hideto NAKANE Nippo-Vini Fantini s.t. 105 Manuele BOARO Bahrain-Merida s.t. 108 Matthias BRÄNDLE Trek-Segafredo s.t. 115 Rick ZABEL Katusha Alpecin s.t. 116 Matvey MAMYKIN Katusha Alpecin s.t. 117 Maurits LAMMERTINK Katusha Alpecin s.t. 120 Mattia FRAPPORTI Androni Giocattoli s.t. 125 Julian David ARREDONDO MORENO Nippo-Vini Fantini s.t. 130 Gianni MOSCON Sky s.t. 146 Roberto FERRARI UAE Abu Dhabi s.t. 158 Martijn VERSCHOOR Novo Nordisk s.t. 159 Fabio CALABRIA Novo Nordisk s.t. 160 David LOZANO RIBA Novo Nordisk s.t. 169 Alessandro TONELLI Bardiani-CSF s.t. Stage winner Geraint Thomas right after the stage. Stage winner BMC sent me this report. 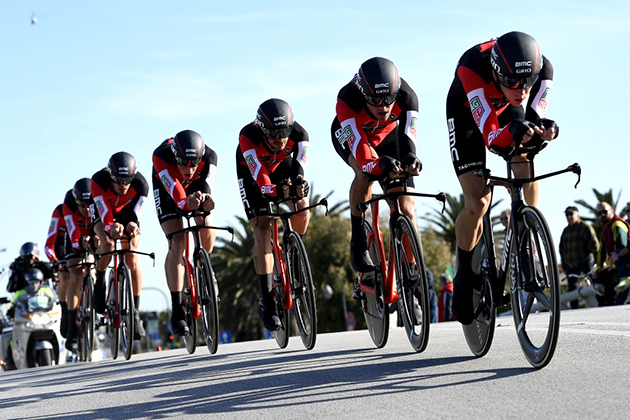 An impressive display of time trialling prowess on Tirreno-Adriatico Stage 1 saw BMC Racing Team secure a second consecutive victory on the 22.7km out and back course ahead of Quick-Step Floors Cycling and FDJ. BMC Racing Team were the final team to start, rolling down the ramp as the pre-race favorites having won here one year earlier. But, if the eight-rider team felt the weight of any pre-race expectations, they didn't show it. 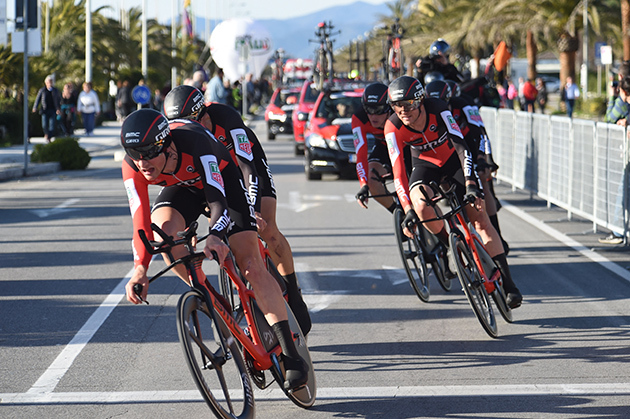 Out on the course, BMC Racing Team quickly settled into a seamless rhythm as they looked to better 23'37", the time set by Quick-Step Floors Cycling Team. Fifth-fastest at the complicated turning point, including two left-hand 90-degree turns, BMC Racing Team kicked it up another gear heading into the second half of the course. In a brilliant show of strength and teamwork, the riders stopped the clock at 23'20" which was more than enough to claim the stage win and put Damiano Caruso into the leader's jersey. Congratulations, Damiano. 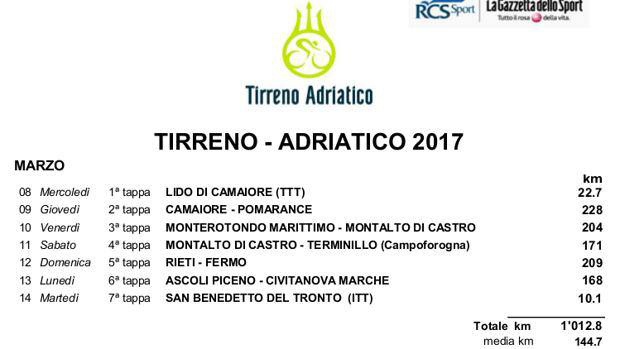 You're the leader of the Tirreno-Adriatico, how does it feel? "I feel really good, really excited. This is a dream come true. The team was incredible today. Rohan Dennis and Stefan Küng made a huge difference, and we were setting a really, really fast pace. In the end, it was a surprise for us to finish 17 seconds ahead and faster than last year so, it is incredible. Now I will enjoy wearing this jersey, and from tomorrow we will see what happens." 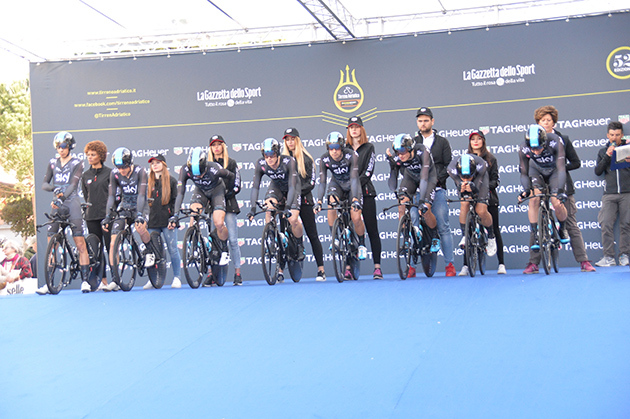 The team had seen the time set by Quick-Step Floors Cycling Team, did this add any pressure or was it more motivation? "We weren't really thinking about the time of the other teams. We were all focusing on our jobs. We wanted to win today so we just we went full gas right up until the finish." How hard was it to keep that pace up over the 22.7km course? "It was really hard, but I knew how strong these guys are so I was ready to give it everything for them." "We have a really strong team, and we wanted to go for the win. The most important thing in a team time trial, especially a flat one, is always to keep the speed high and that's what we did today. We had everything that it took to be the best. This is a great victory for the team, and we showed that we don't have to fear anybody." 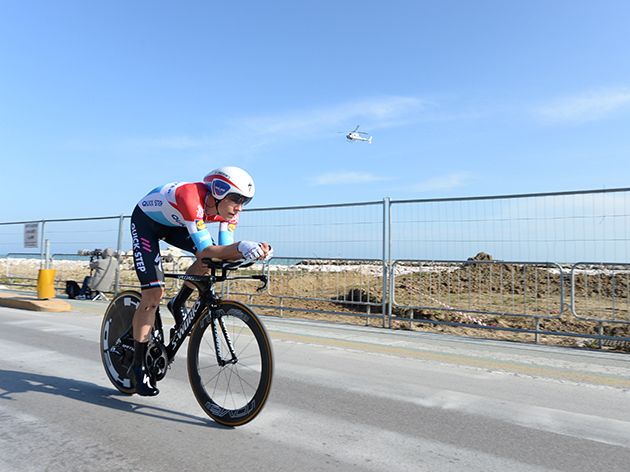 "I love time trialling, and when you are going that fast, you have the impression that you are flying. When you hear the wheels roaring, it is just great. That's what we train for, to go as fast as possible and when you win in the end, you know you did something right over the winter." "Today feels incredible. 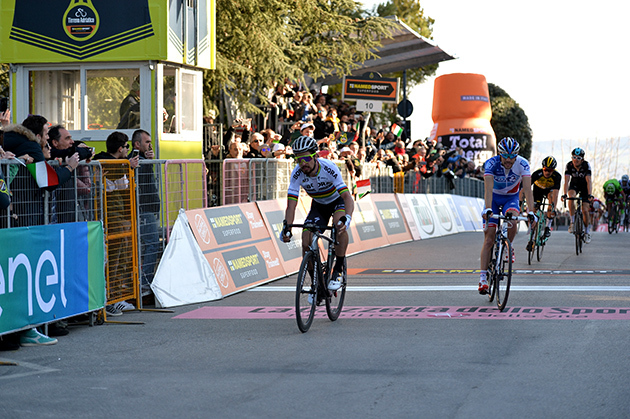 It is always good to get a stage victory, especially with this team. 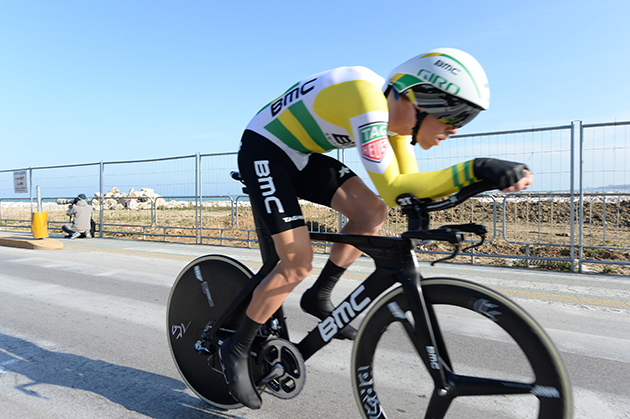 As a team we put a lot of emphasis on team time trials, it has really become part of the BMC Racing Team identity. For me, the key to winning a team trial is the confidence, the bravado, and the attitude of the team. It's not cracking under pressure, and we lived up to that mentality today." "It is always better to start ahead than behind so it's great to get a leg up on the other GC contenders heading into the big stages. The season is still young, and I don't have a lot of racing in my legs, but I feel good on the bike and my the morale is good. We have had a good start here so if we keep this momentum going, I should be in a really good place." 4 Stefan KÜNG BMC s.t. 6 Tejay VAN GARDEREN BMC s.t. 8 Matteo TRENTIN Quick-Step s.t. 9 Bob JUNGELS Quick-Step s.t. 10 Julien VERMOTE Quick-Step s.t. 11 Zdenek ŠTYBAR Quick-Step s.t. 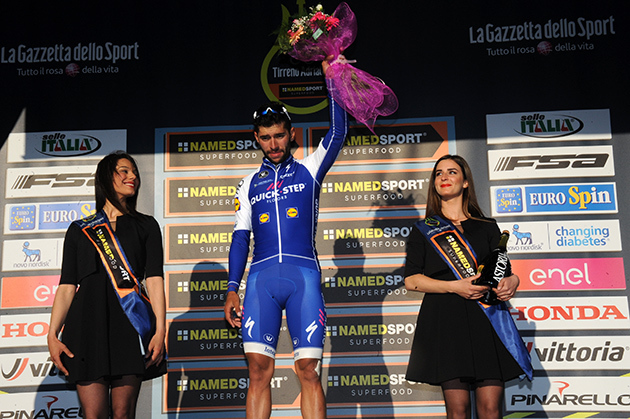 12 Fernando GAVIRIA Quick-Step s.t. 13 Niki TERPSTRA Quick-Step s.t. 15 Jérémy ROY FDJ s.t. 16 Matthieu LADAGNOUS FDJ s.t. 17 Steve MORABITO FDJ s.t. 18 Thibaut PINOT FDJ s.t. 21 Nairo QUINTANA Movistar s.t. 22 Daniel MORENO Movistar s.t. 23 Nelson OLIVEIRA Movistar s.t. 24 Andrey AMADOR Movistar s.t. 25 Jasha SÜTTERLIN Movistar s.t. 27 Luke DURBRIDGE Orica-Scott s.t. 28 Michael HEPBURN Orica-Scott s.t. 29 Adam YATES Orica-Scott s.t. 30 Daryl IMPEY Orica-Scott s.t. 31 Luka MEZGEC Orica-Scott s.t. 33 Enrico BATTAGLIN Lotto NL-Jumbo s.t. 34 Primož ROGLIC Lotto NL-Jumbo s.t. 35 Robert GESINK Lotto NL-Jumbo s.t. 36 Lars BOOM Lotto NL-Jumbo s.t. 39 Maxime MONFORT Lotto Soudal s.t. 40 Tiesj BENOOT Lotto Soudal s.t. 41 Tim WELLENS Lotto Soudal s.t. 42 Jurgen ROELANDTS Lotto Soudal s.t. 44 Kanstantsin SIUTSOU Bahrain-Merida s.t. 45 Valerio AGNOLI Bahrain-Merida s.t. 46 Vincenzo NIBALI Bahrain-Merida s.t. 47 Manuele BOARO Bahrain-Merida s.t. 48 Javier MORENO BAZAN Bahrain-Merida s.t. 49 Franco PELLIZOTTI Bahrain-Merida s.t. 50 Stephen CUMMINGS Dimension Data s.t. 51 Jay Robert THOMSON Dimension Data s.t. 52 Scott THWAITES Dimension Data s.t. 54 Edvald BOASSON HAGEN Dimension Data s.t. 56 Fabio ARU Astana s.t. 57 Oscar GATTO Astana s.t. 58 ANDREY GRIVKO Astana s.t. 59 Dmitriy GRUZDEV Astana s.t. 60 Michele SCARPONI Astana s.t. 62 Georg PREIDLER Sunweb s.t. 63 Chad HAGA Sunweb s.t. 64 Mike TEUNISSEN Sunweb s.t. 65 Tom DUMOULIN Sunweb s.t. 67 Bauke MOLLEMA Trek-Segafredo s.t. 68 Matthias BRÄNDLE Trek-Segafredo s.t. 69 Markel IRIZAR Trek-Segafredo s.t. 70 Boy VAN POPPEL Trek-Segafredo s.t. 72 Hugo HOULE Ag2r La Mondiale s.t. 73 Alexandre GENIEZ Ag2r La Mondiale s.t. 74 Domenico POZZOVIVO Ag2r La Mondiale s.t. 75 Jan BAKELANTS Ag2r La Mondiale s.t. 79 Matej MOHORIC UAE Abu Dhabi s.t. 80 Rui Alberto FARIA UAE Abu Dhabi s.t. 81 Sacha MODOLO UAE Abu Dhabi s.t. 82 Filippo GANNA UAE Abu Dhabi s.t. 83 Marco MARCATO UAE Abu Dhabi s.t. 84 Vegard Stake LAENGEN UAE Abu Dhabi s.t. 87 Peter SAGAN Bora-hansgrohe s.t. 88 Pawel POLJANSKI Bora-hansgrohe s.t. 89 Cesare BENEDETTI Bora-hansgrohe s.t. 90 Rafal MAJKA Bora-hansgrohe s.t. 94 Rigoberto URAN Cannondale Drapac s.t. 95 Simon CLARKE Cannondale Drapac s.t. 96 Sebastian LANGEVELD Cannondale Drapac s.t. 97 Patrick BEVIN Cannondale Drapac s.t. 99 Matvey MAMYKIN Katusha Alpecin s.t. 100 Ángel VICIOSO ARCOS Katusha Alpecin s.t. 101 Simon ŠPILAK Katusha Alpecin s.t. 102 Maurits LAMMERTINK Katusha Alpecin s.t. 103 Rick ZABEL Katusha Alpecin s.t. 104 Rein TAARAMÄE Katusha Alpecin s.t. 106 Roman KREUZIGER Orica-Scott s.t. 109 Geraint THOMAS Sky s.t. 110 Mikel LANDA MEANA Sky s.t. 111 Salvatore PUCCIO Sky s.t. 112 Diego ROSA Sky s.t. 114 Mattia FRAPPORTI Androni Giocattoli s.t. 115 Egan Arley BERNAL Androni Giocattoli s.t. 116 Raffaello BONUSI Androni Giocattoli s.t. 117 Mattia CATTANEO Androni Giocattoli s.t. 118 Davide BALLERINI Androni Giocattoli s.t. 119 Francesco GAVAZZI Androni Giocattoli s.t. 121 Bart DE CLERCQ Lotto Soudal s.t. 126 Nicola BOEM Bardiani-CSF s.t. 127 Simone VELASCO Bardiani-CSF s.t. 128 Luca WACKERMANN Bardiani-CSF s.t. 129 Enrico BARBIN Bardiani-CSF s.t. 131 Julian David ARREDONDO Nippo-Vini Fantini s.t. 132 Alan MARANGONI Nippo-Vini Fantini s.t. 133 Iuri FILOSI Nippo-Vini Fantini s.t. 134 Ivan SANTAROMITA Nippo-Vini Fantini s.t. 135 Hideto NAKANE Nippo-Vini Fantini s.t. 140 Fabio CALABRIA Novo Nordisk s.t. 141 Charles PLANET Novo Nordisk s.t. 142 Javier MEGIAS LEAL Novo Nordisk s.t. 143 David LOZANO RIBA Novo Nordisk s.t. 146 Elia VIVIANI Sky s.t. 151 Koen DE KORT Trek-Segafredo s.t. 159 Vasil KIRYIENKA Sky s.t. 163 Romain GIOUX Novo Nordisk s.t. 165 Bernhard EISEL Dimension Data s.t. 166 Johann VAN ZYL Dimension Data s.t. 168 Roger KLUGE Orica-Scott s.t. 171 Albert TIMMER Sunweb s.t.